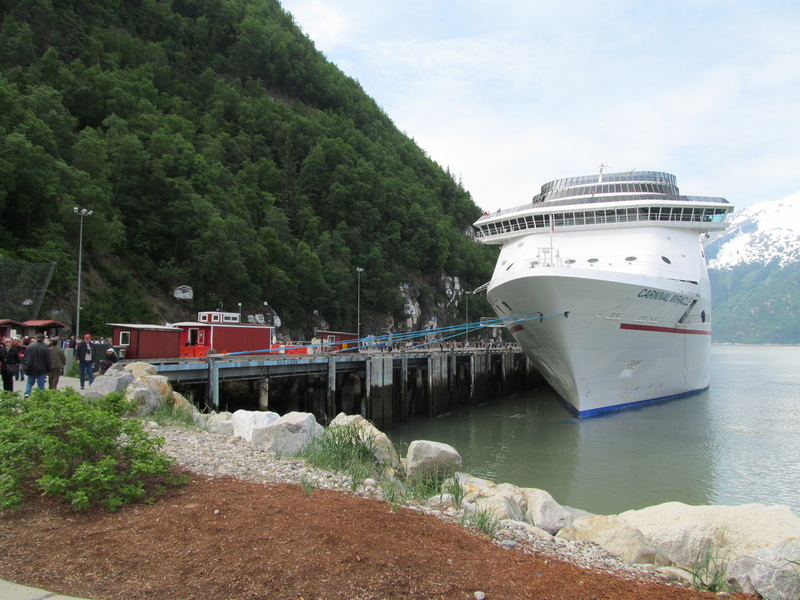 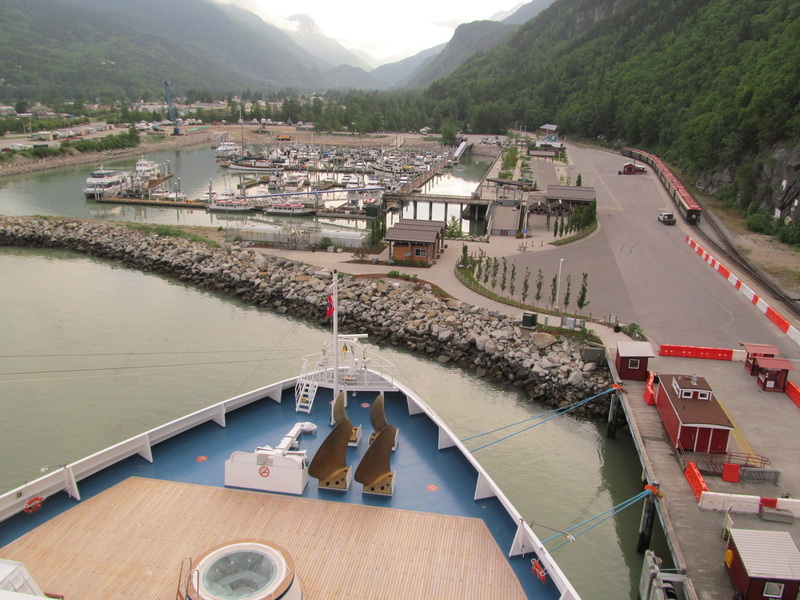 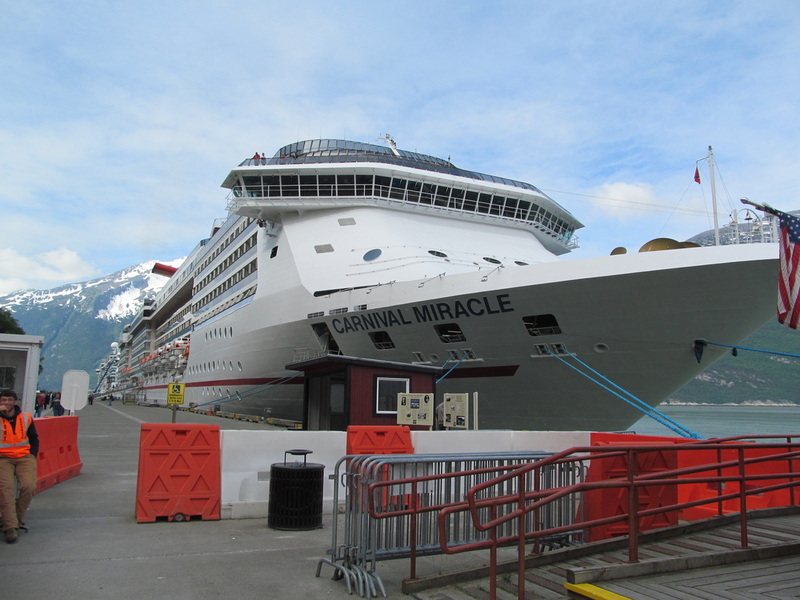 Daily Overview: Today the Carnival Miracle docked in Skagway, Alaska. 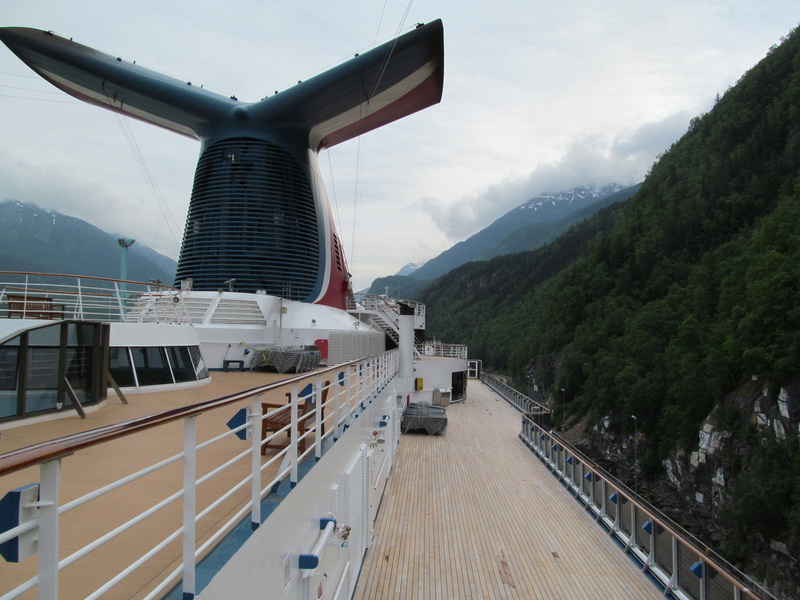 The ship arrived before 6:00AM because it was docked when I woke up. 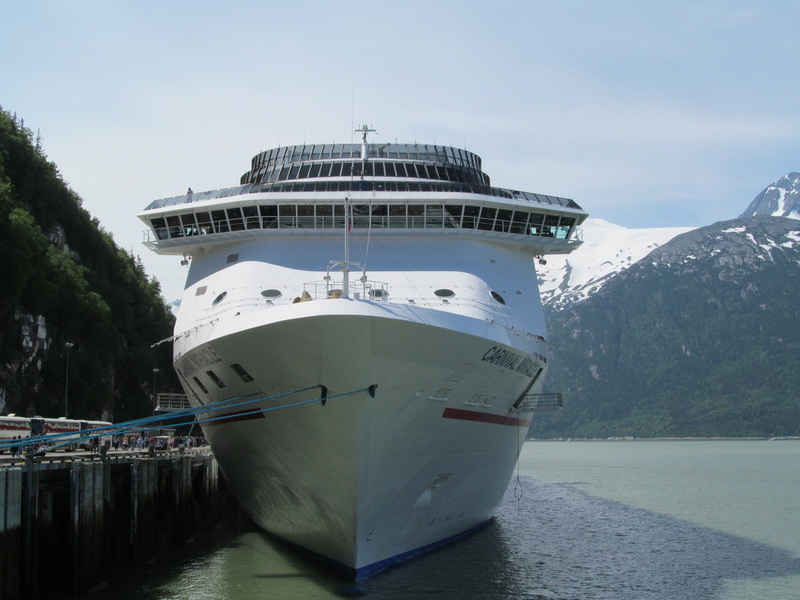 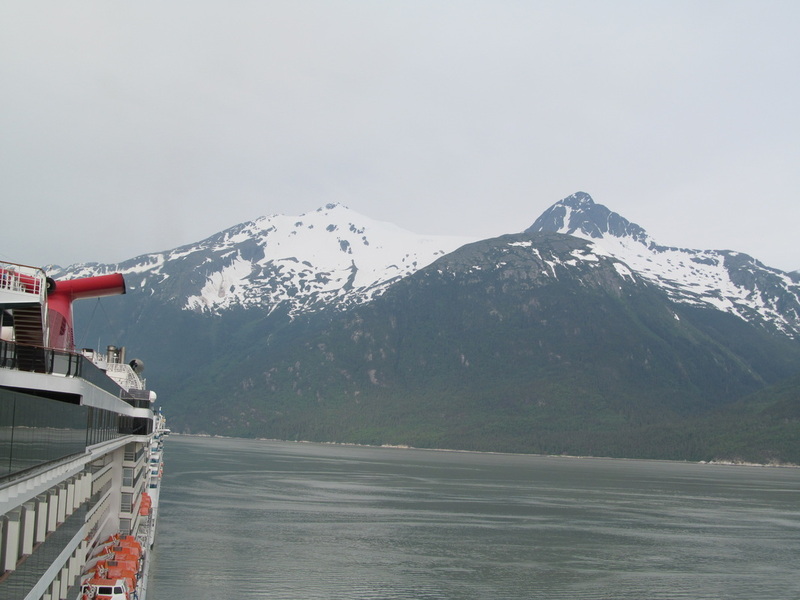 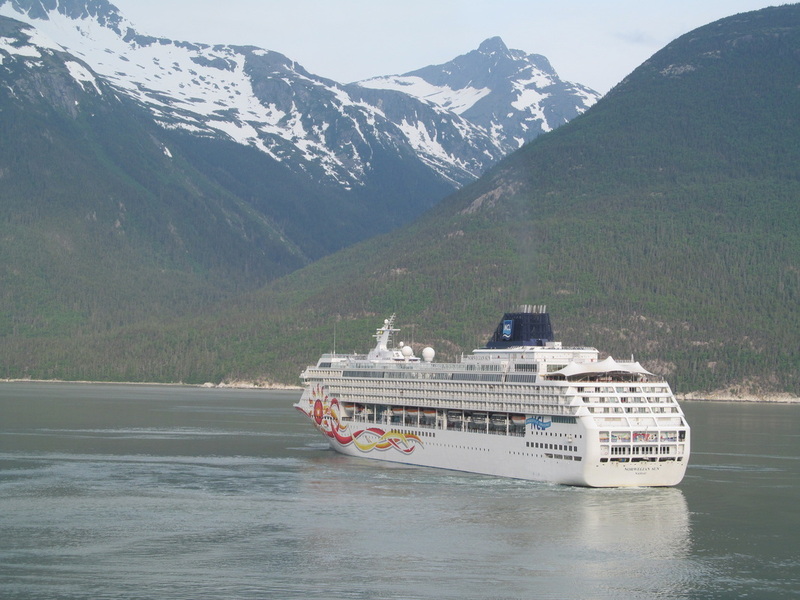 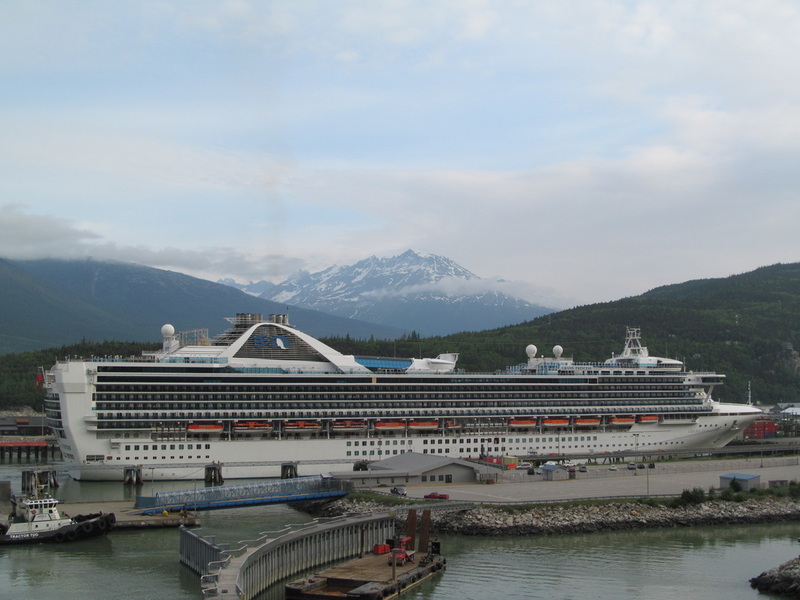 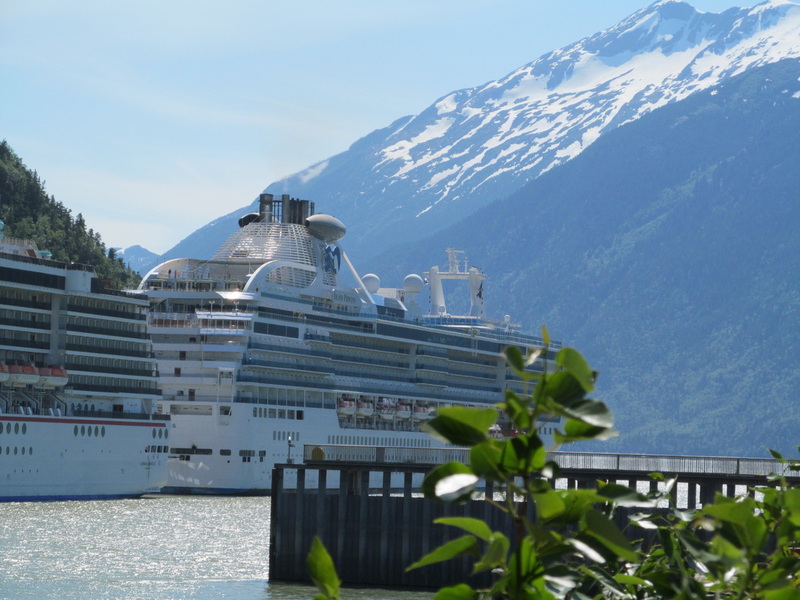 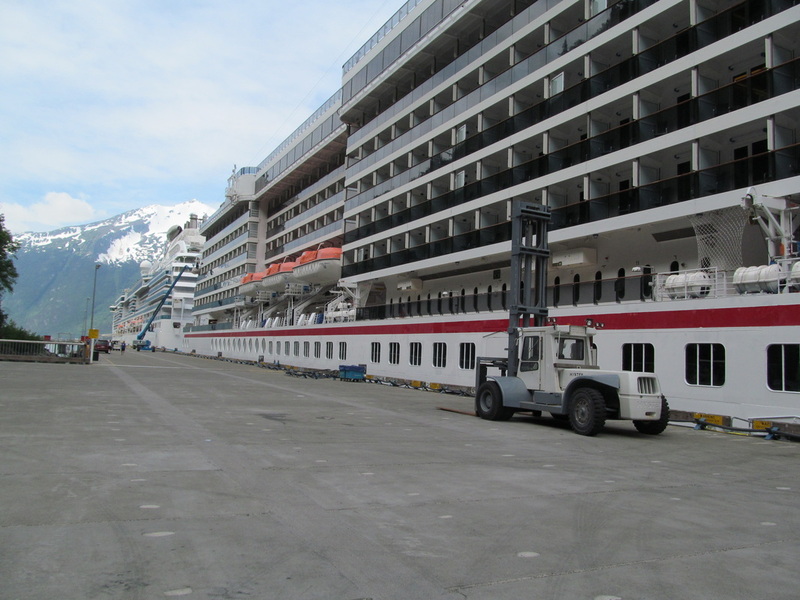 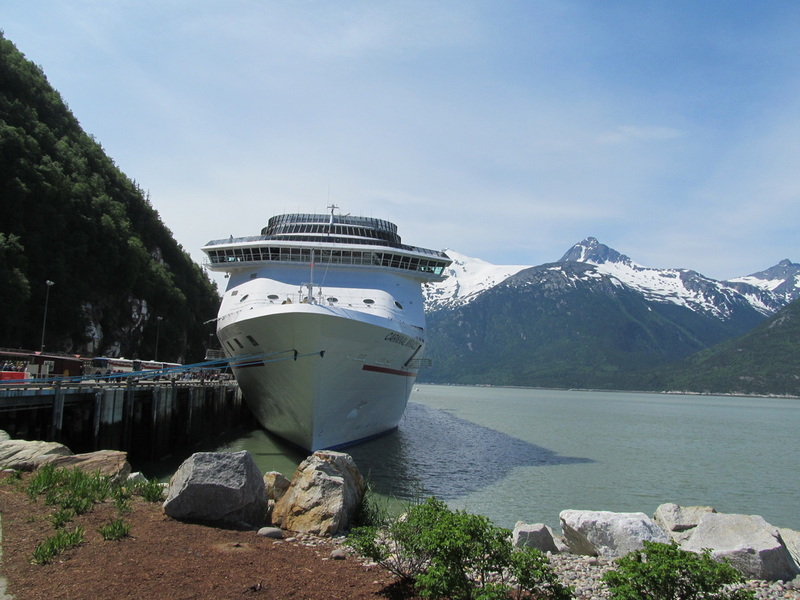 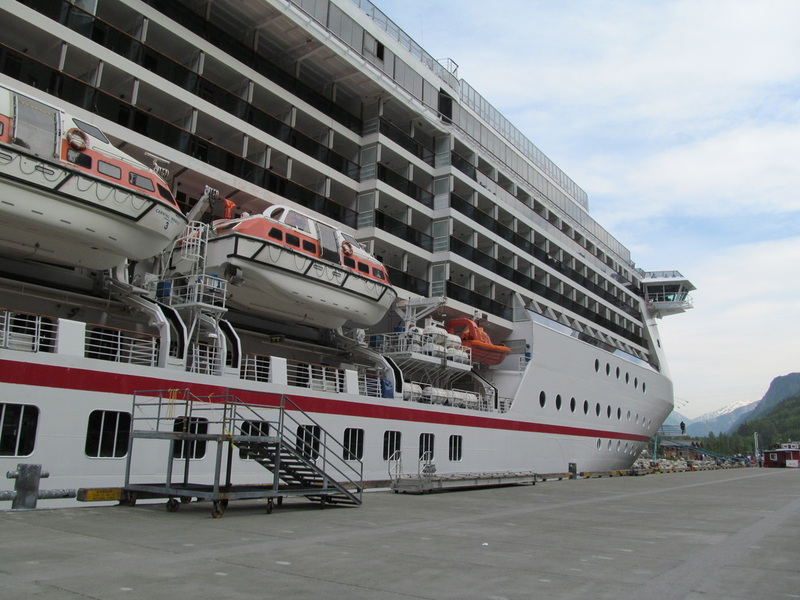 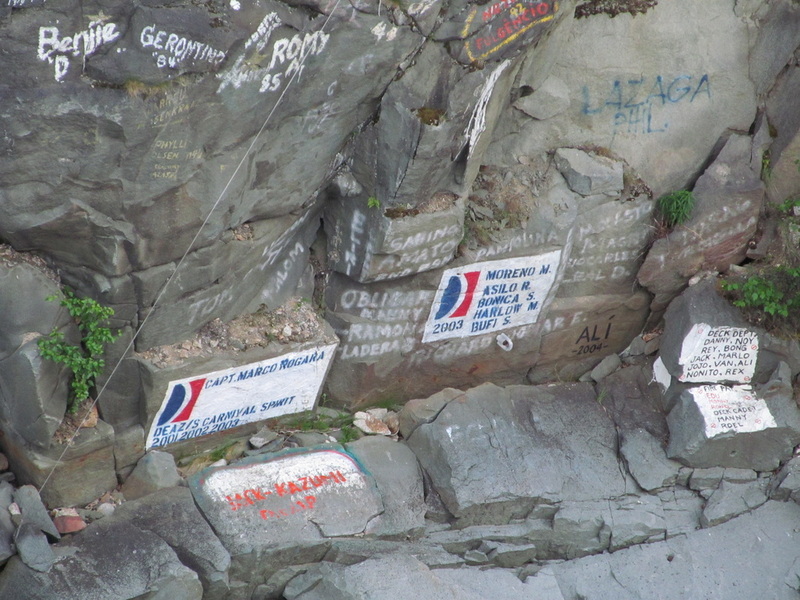 The Carnival Miracle shared Skagway with Island Princess, Grand Princess, and the Norwegian Sun. 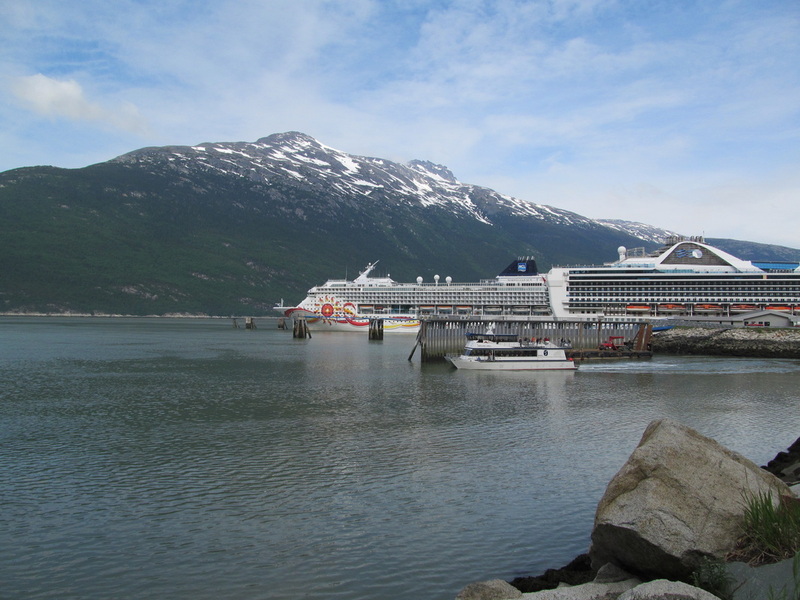 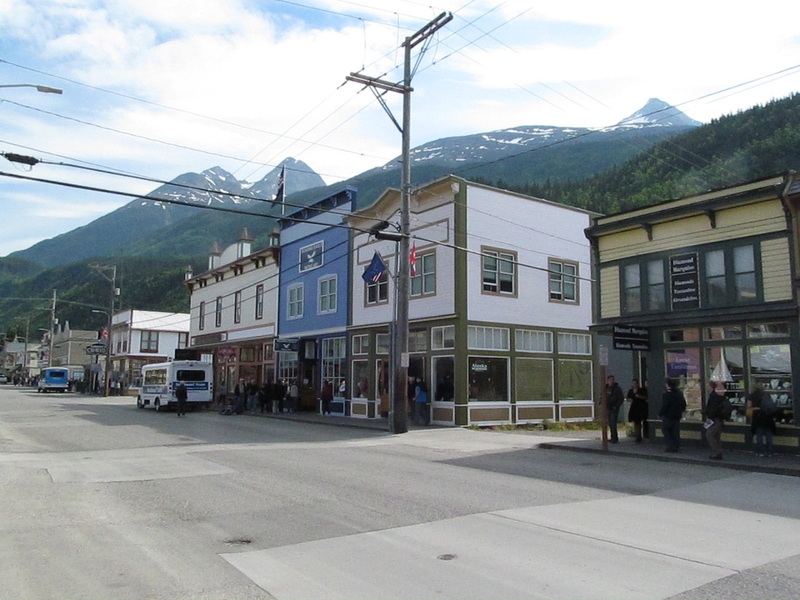 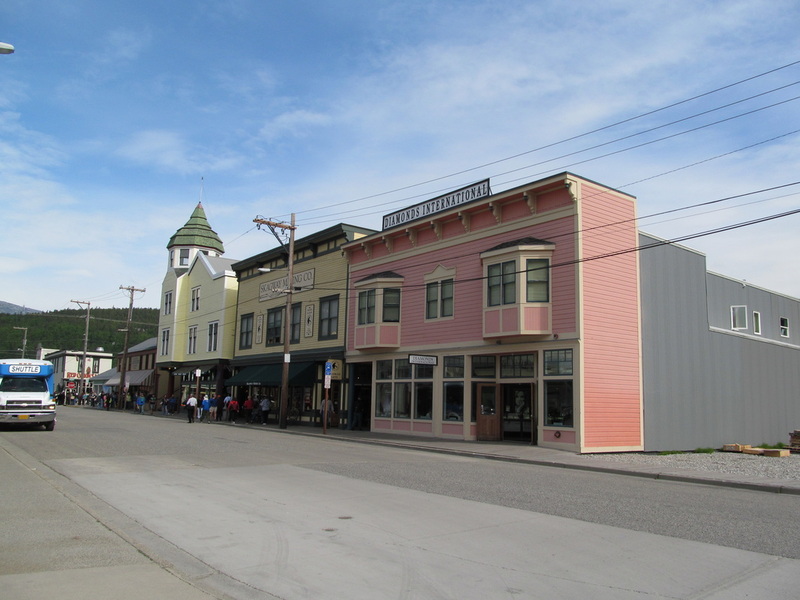 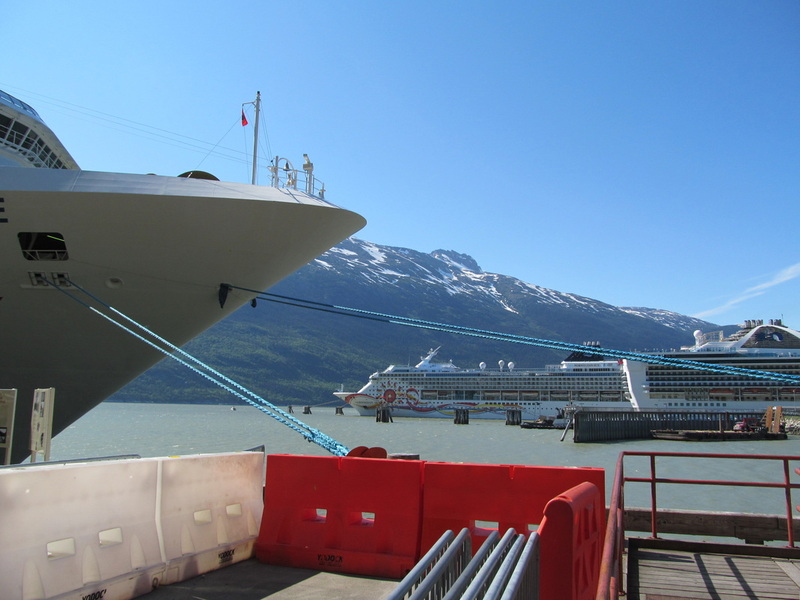 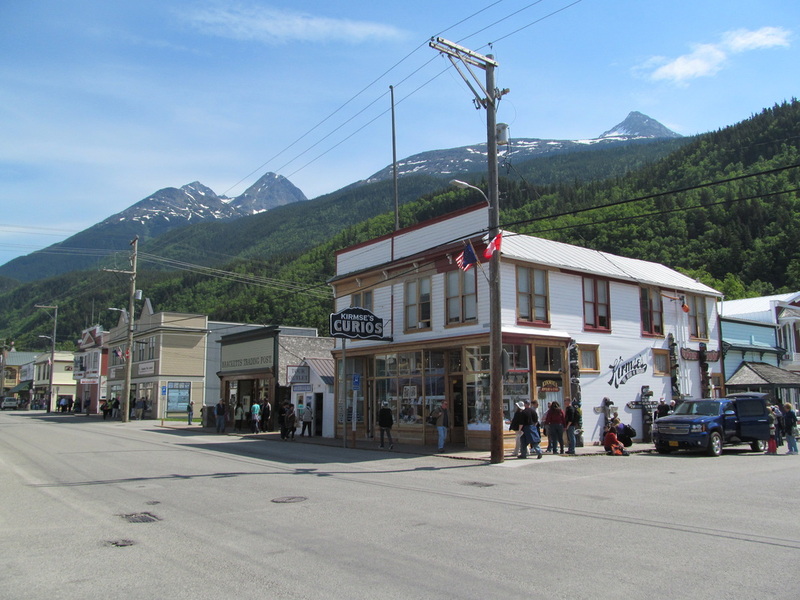 Skagway was crowded during the morning and early afternoon because of 4 cruise ships docked. 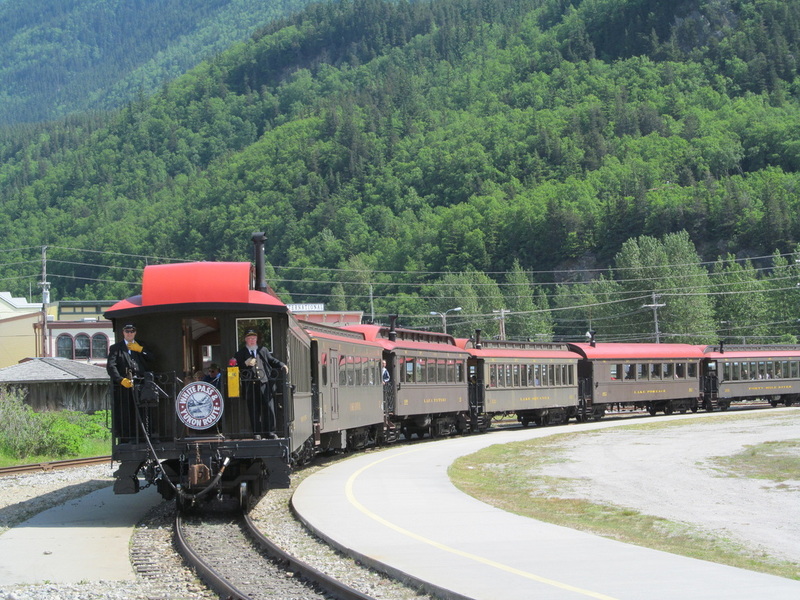 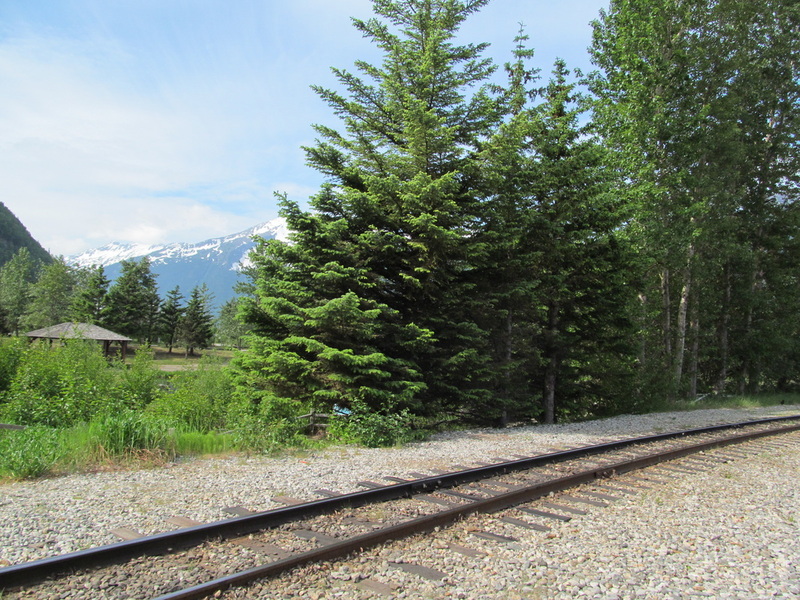 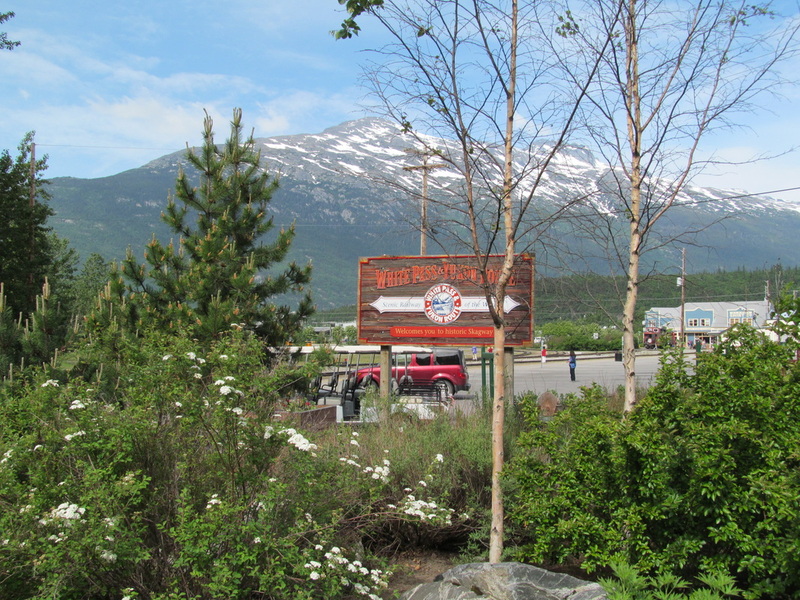 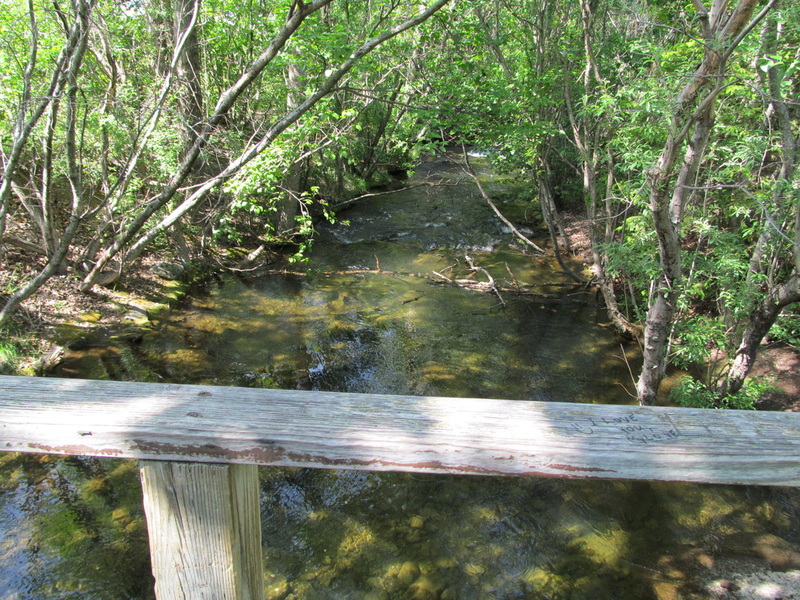 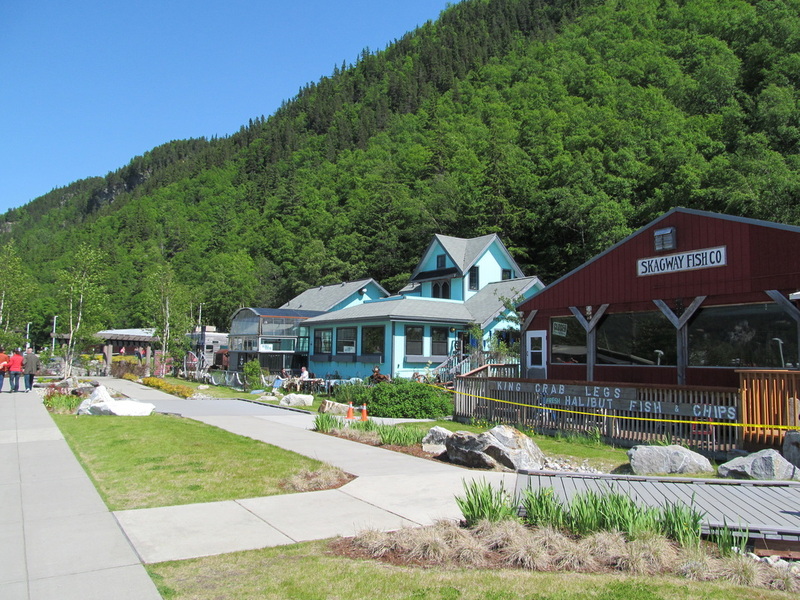 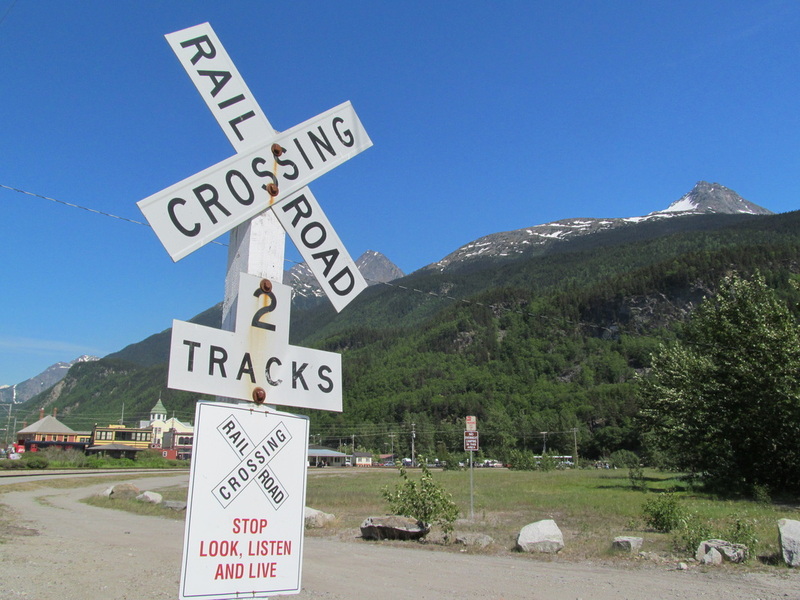 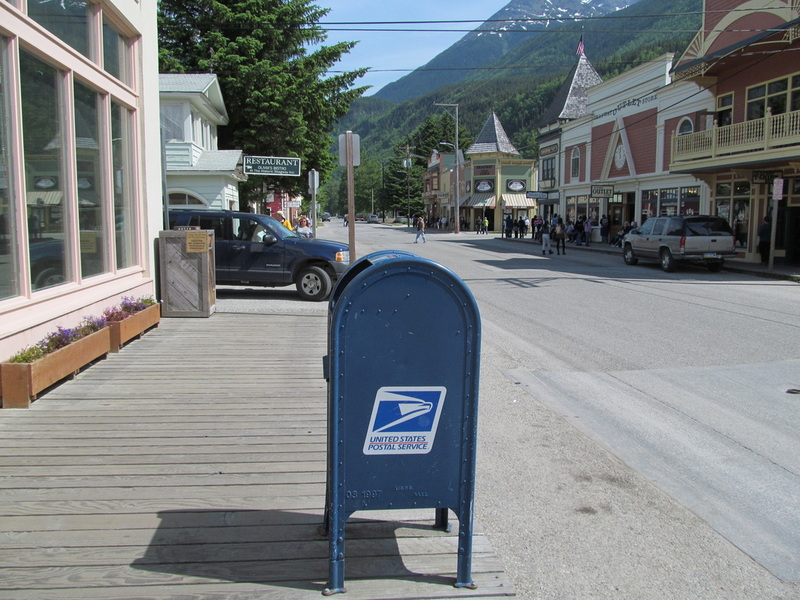 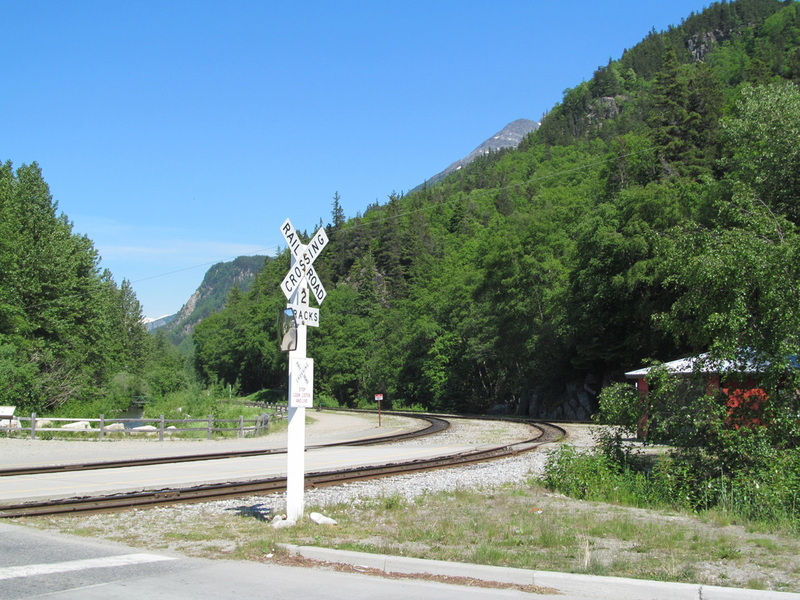 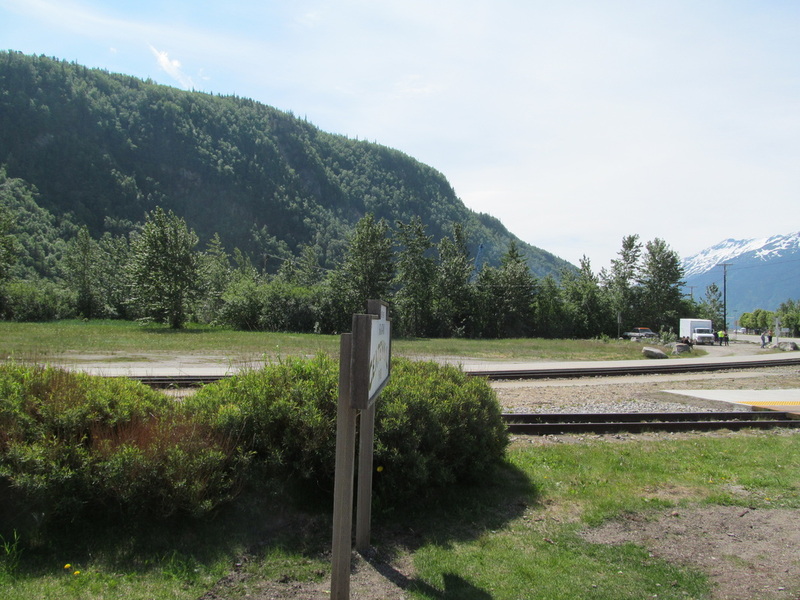 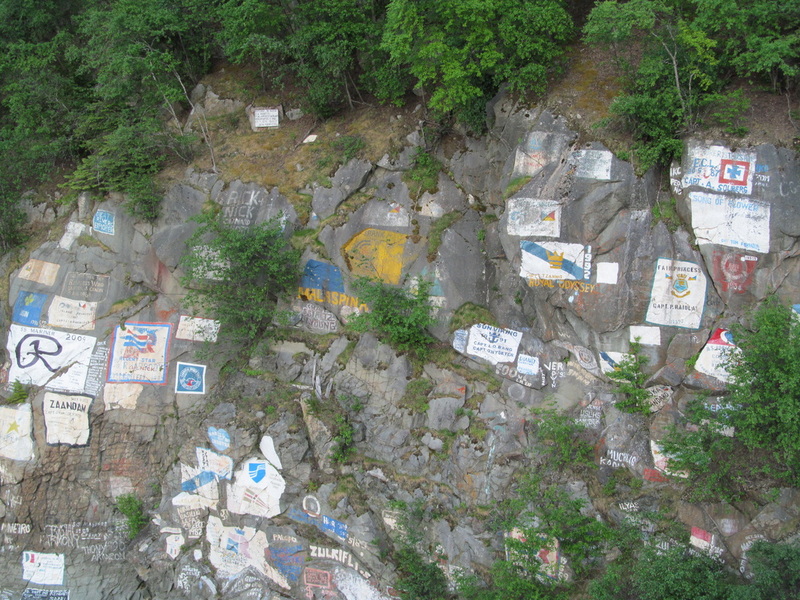 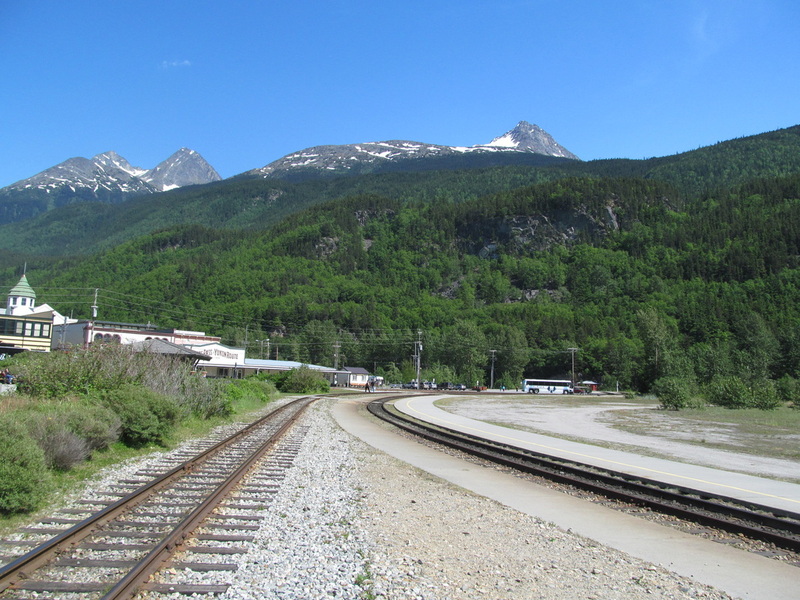 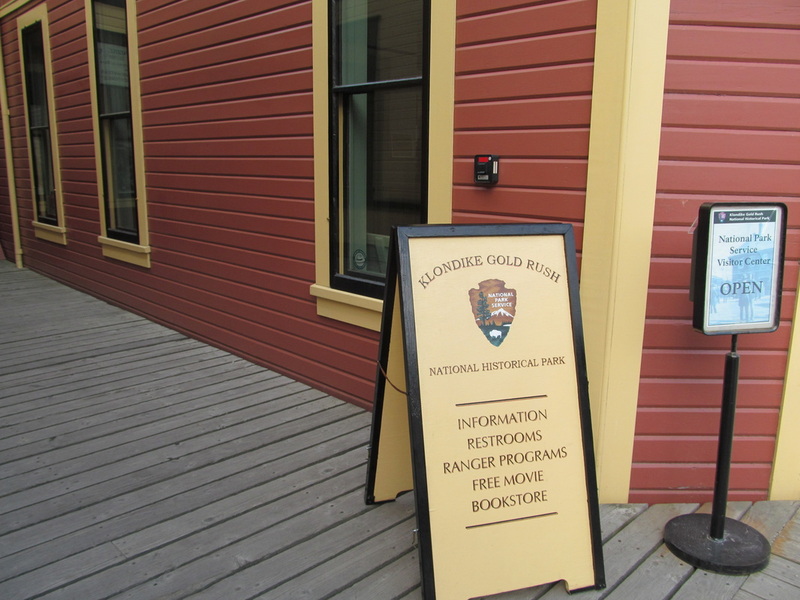 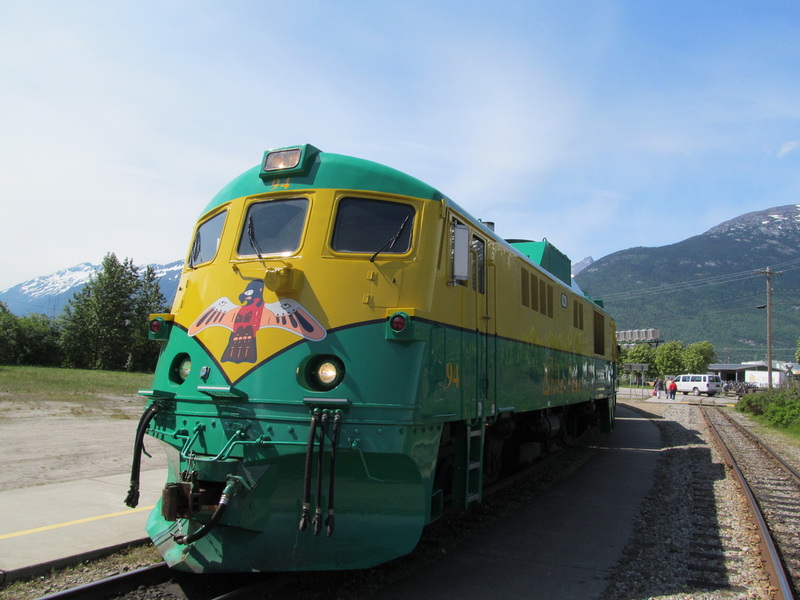 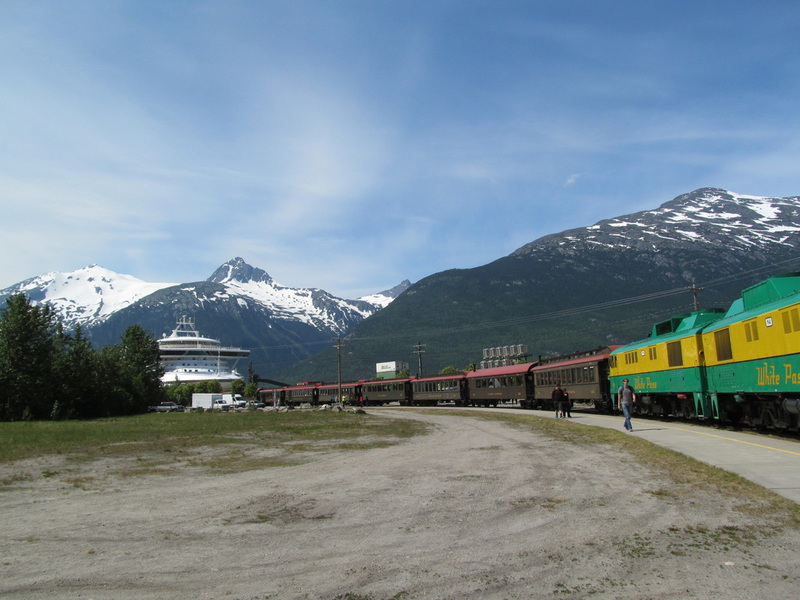 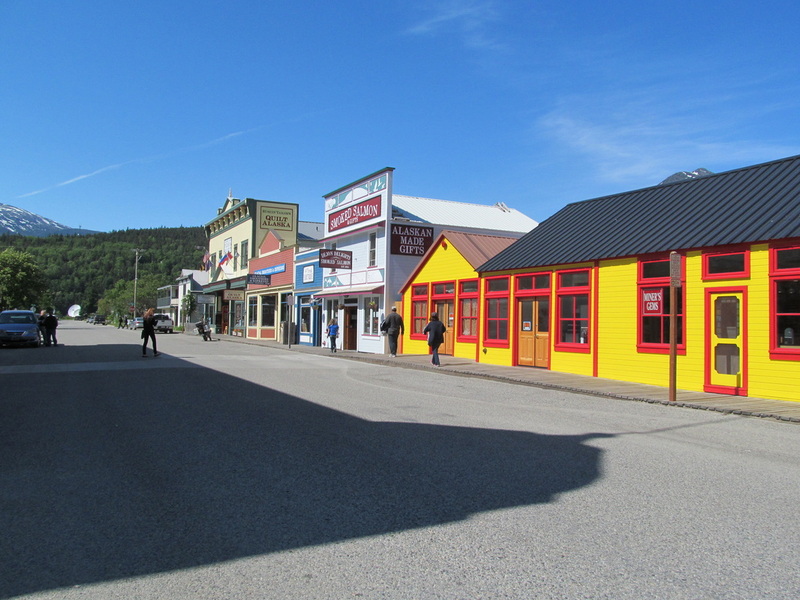 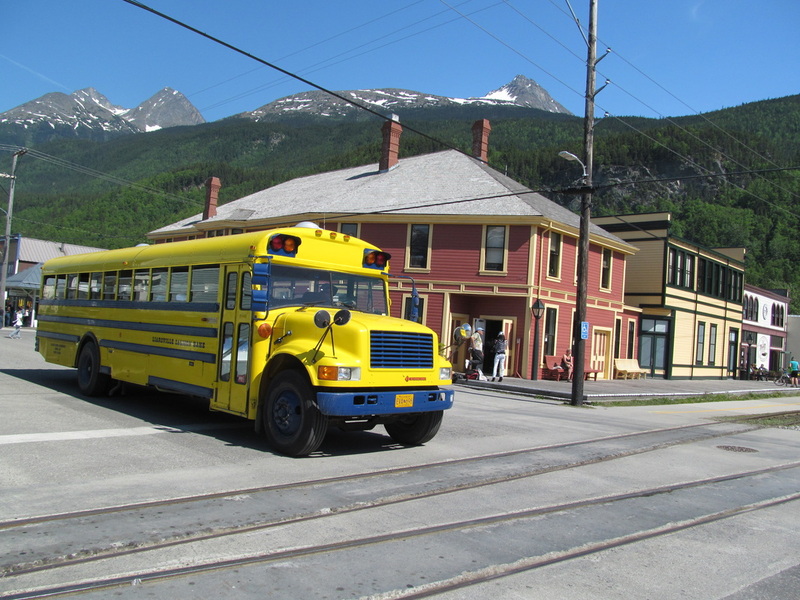 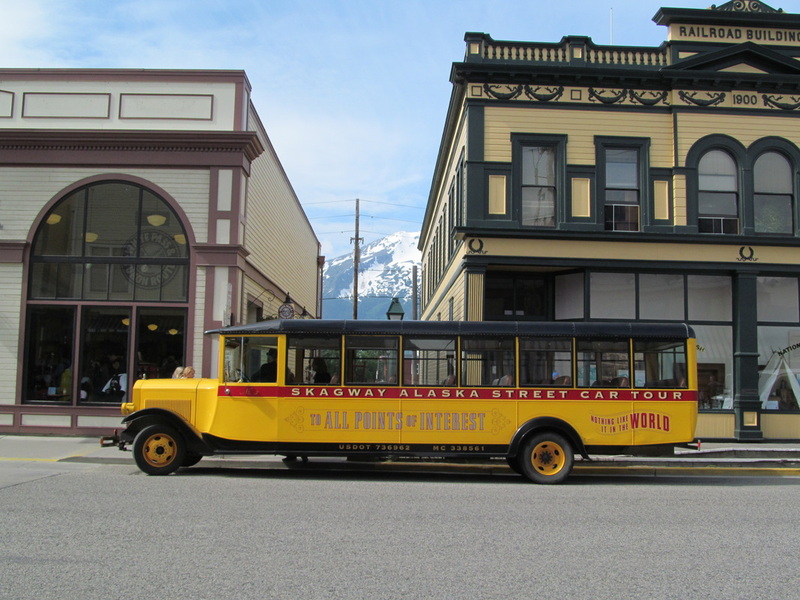 I enjoyed the stop in Skagway, Alaska! 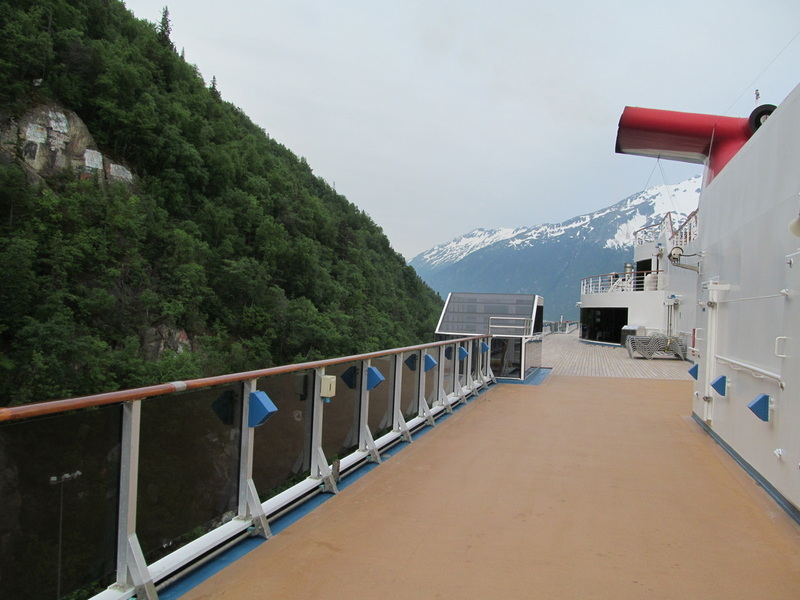 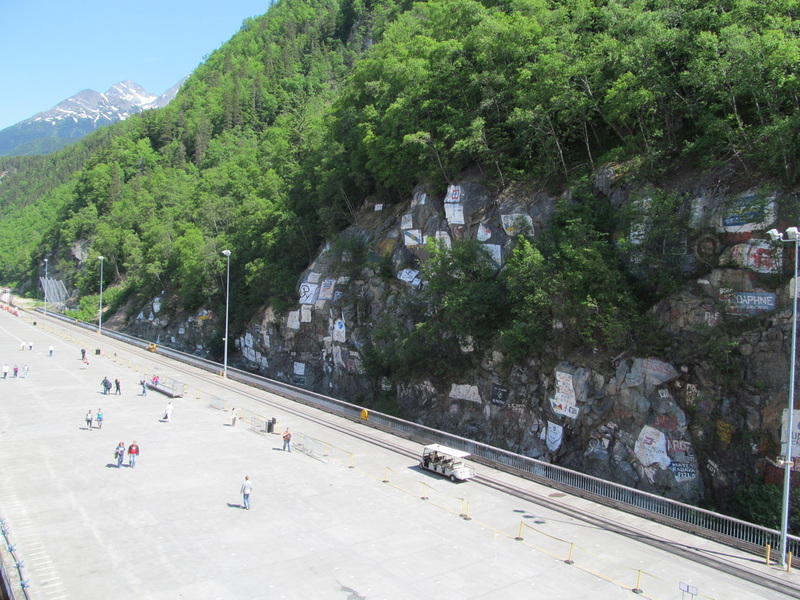 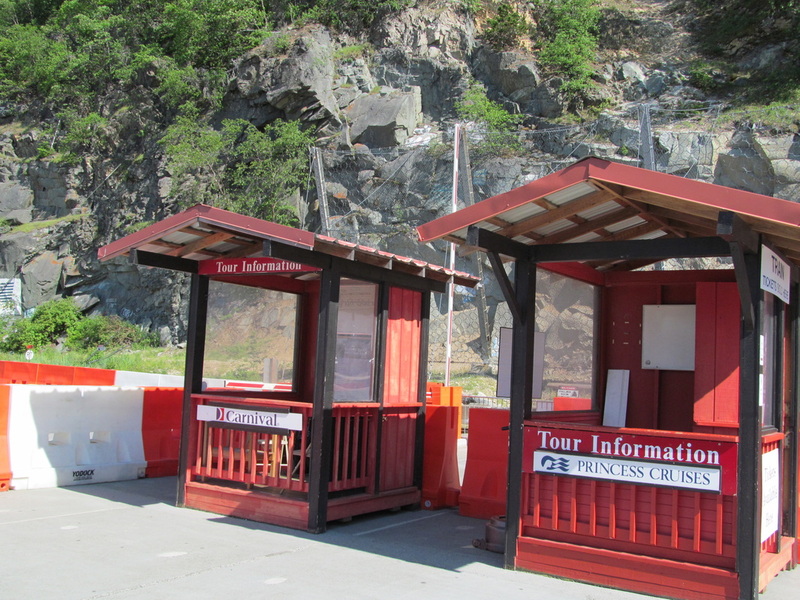 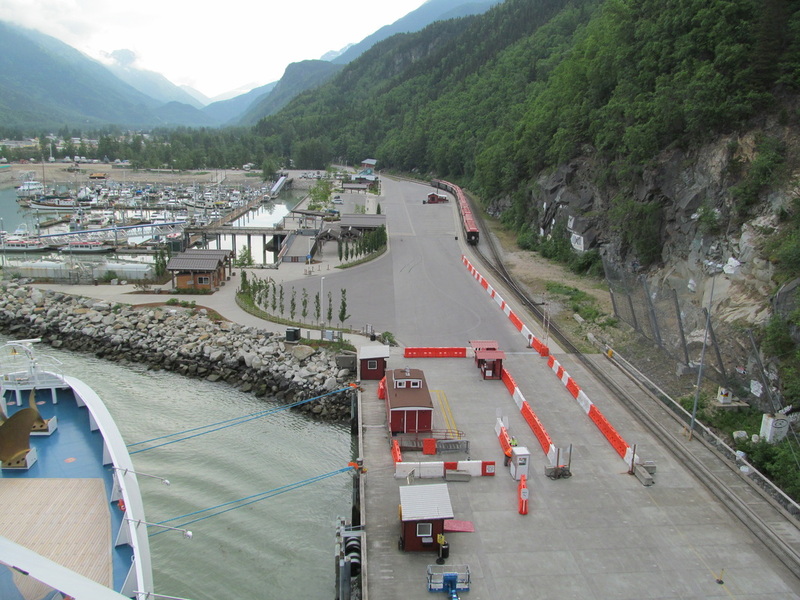 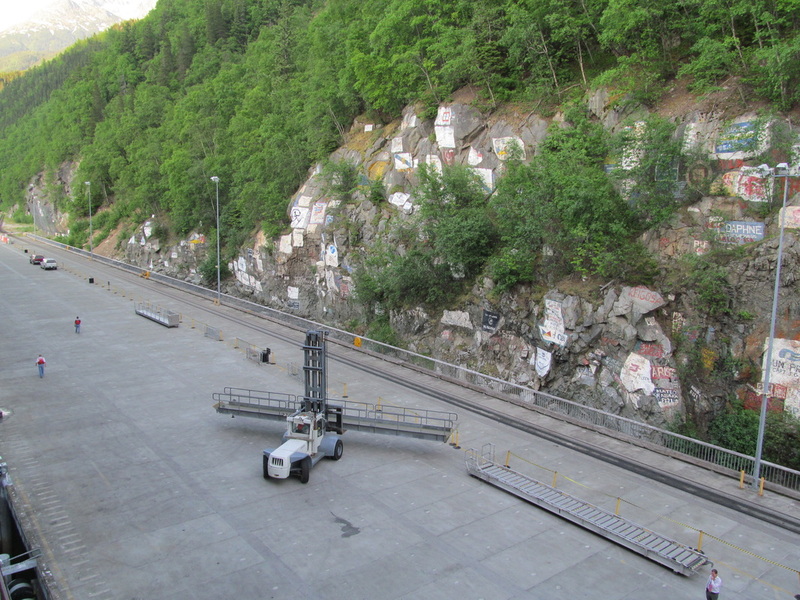 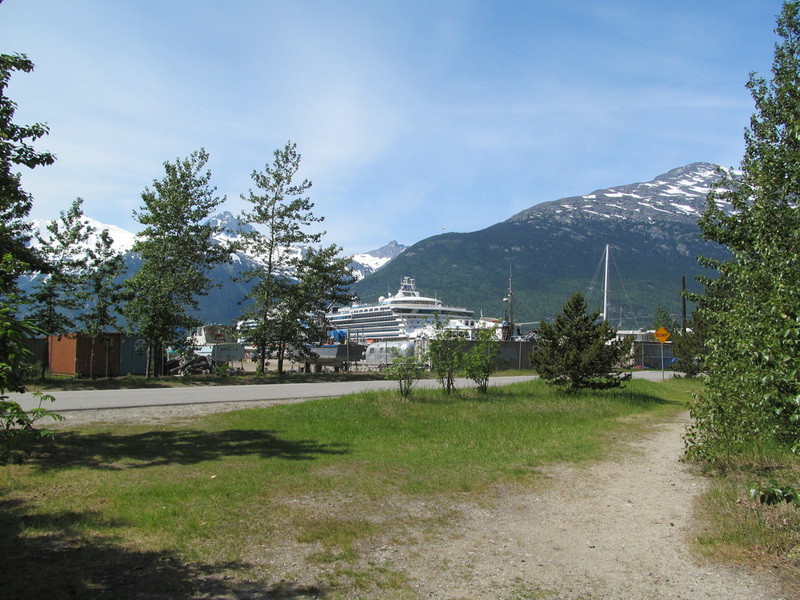 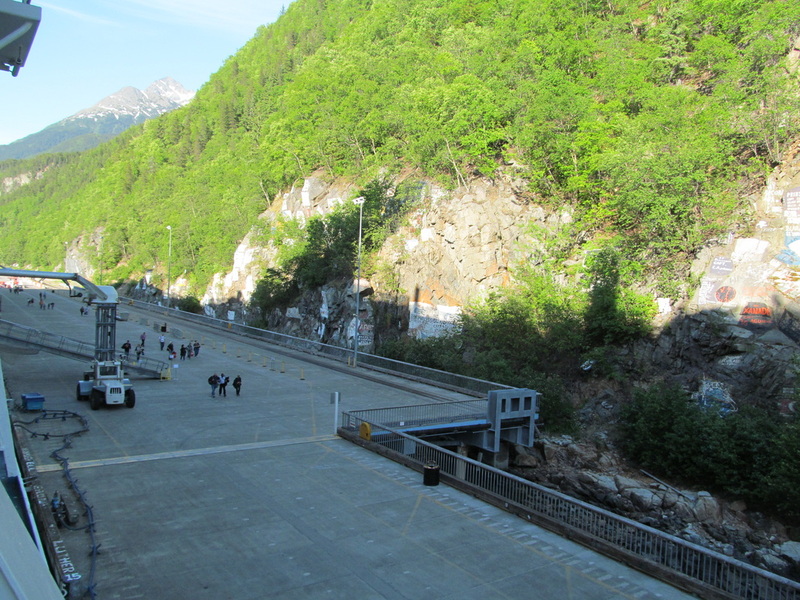 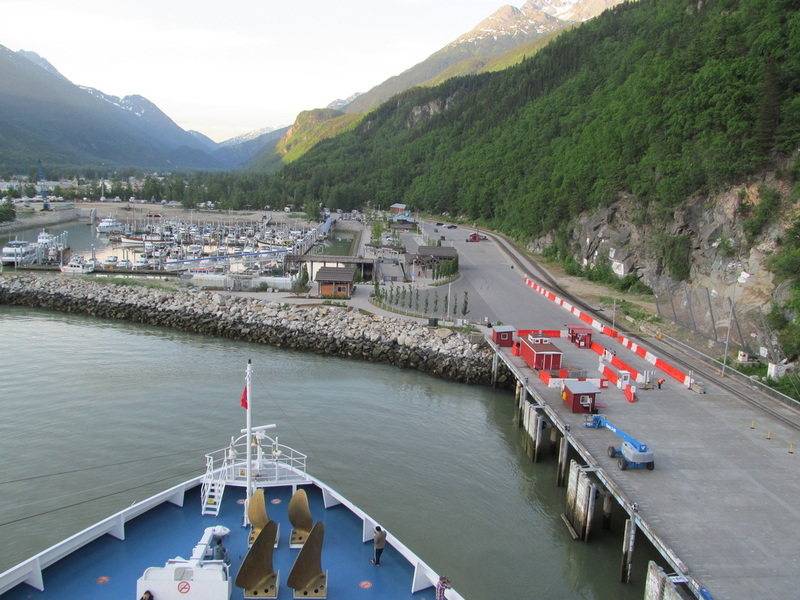 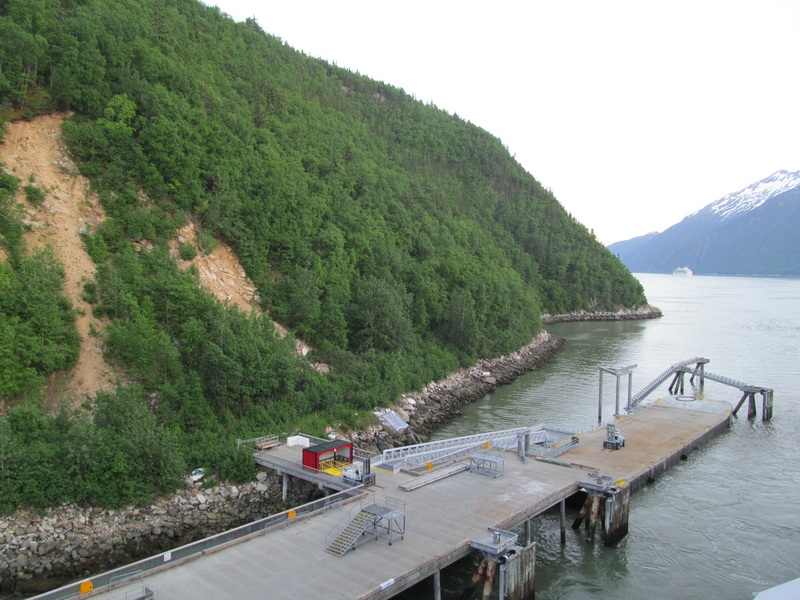 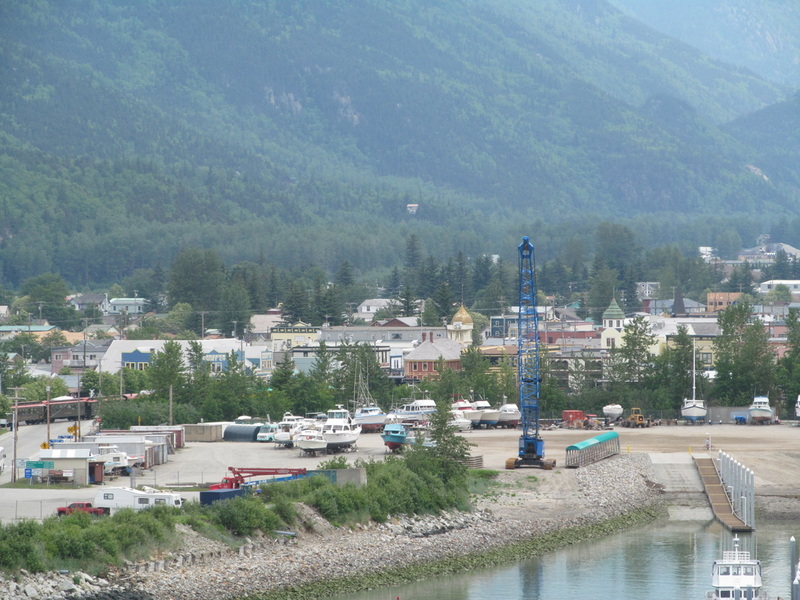 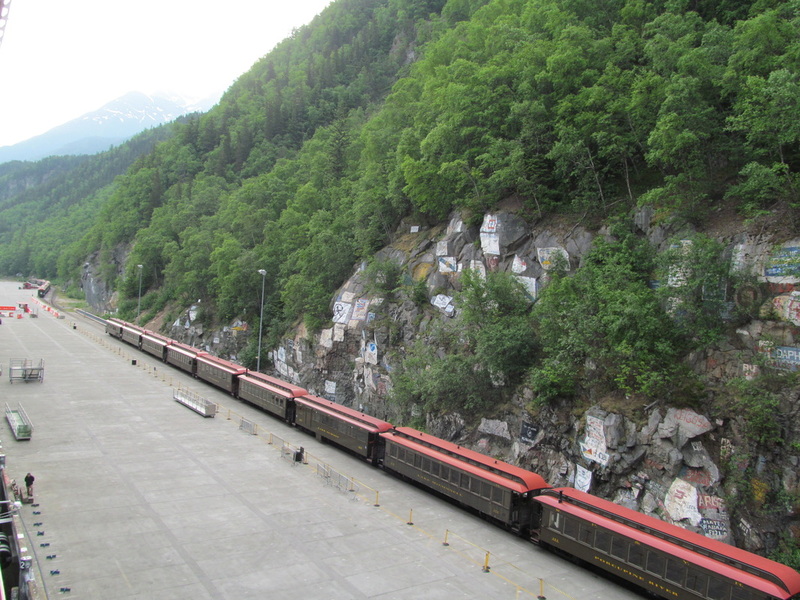 Before breakfast I went to the front area of Deck 9, Lido, to look at Skagway. 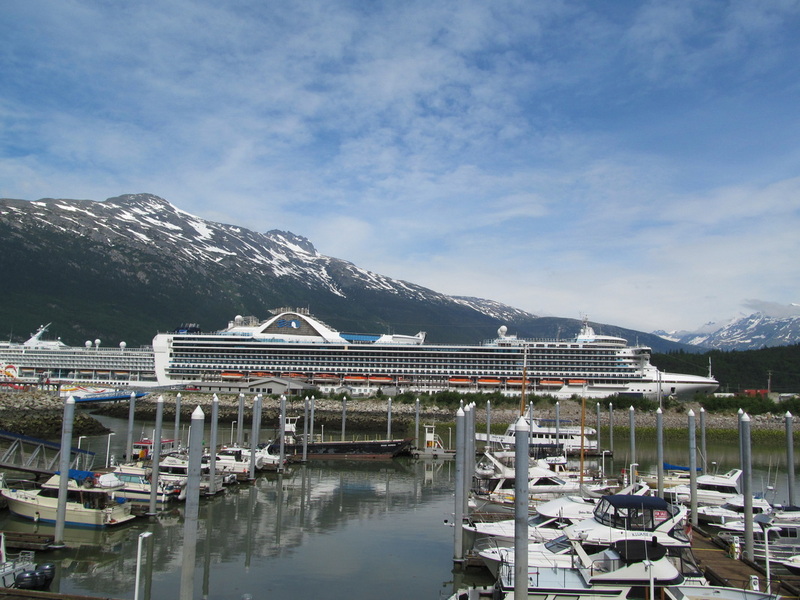 It was cold in the morning, but the temperature increased to the high 70's or low 80's by noon. The afternoon was very hot! I had breakfast in Horatio's Lido Buffet. 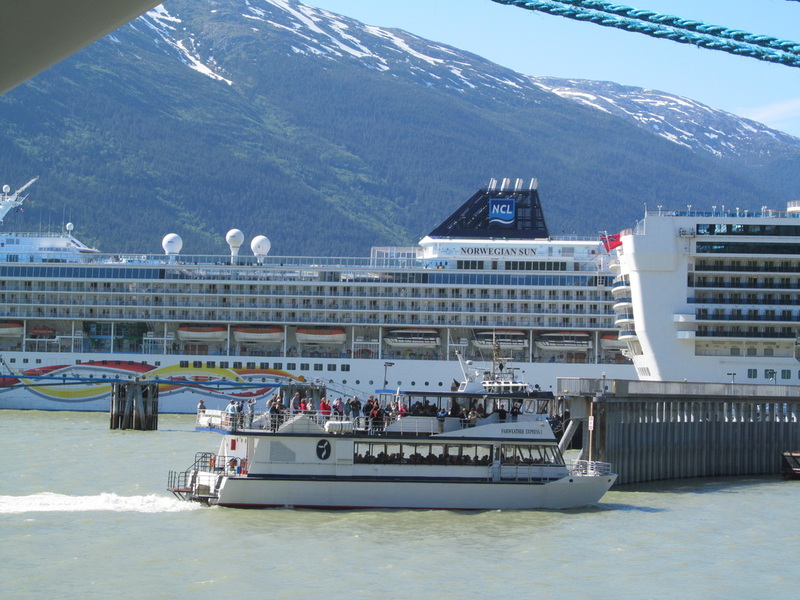 The buffet was very crowded because the majority of passengers were in a hurry to get off. 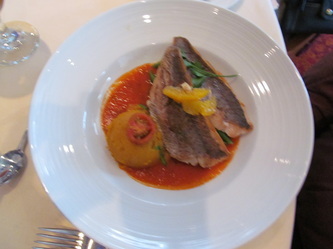 I decided to wait to eat later than normal in order to try to avoid the large lido crowd. 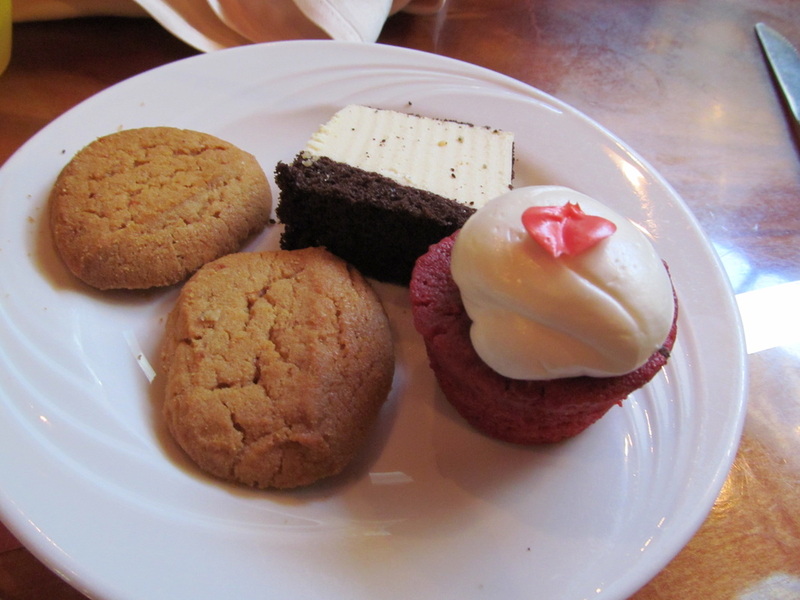 An hour after breakfast had started the buffet was still packed. 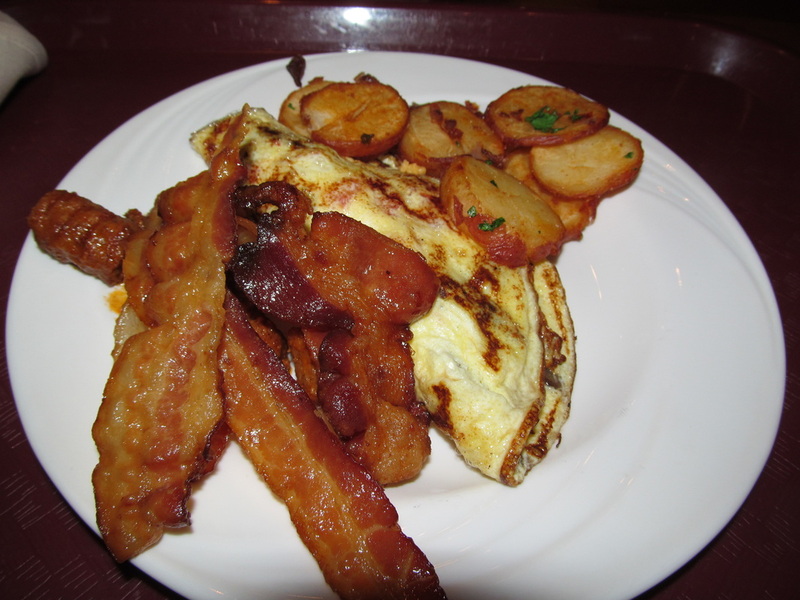 The breakfast food was the typical and was still very good! 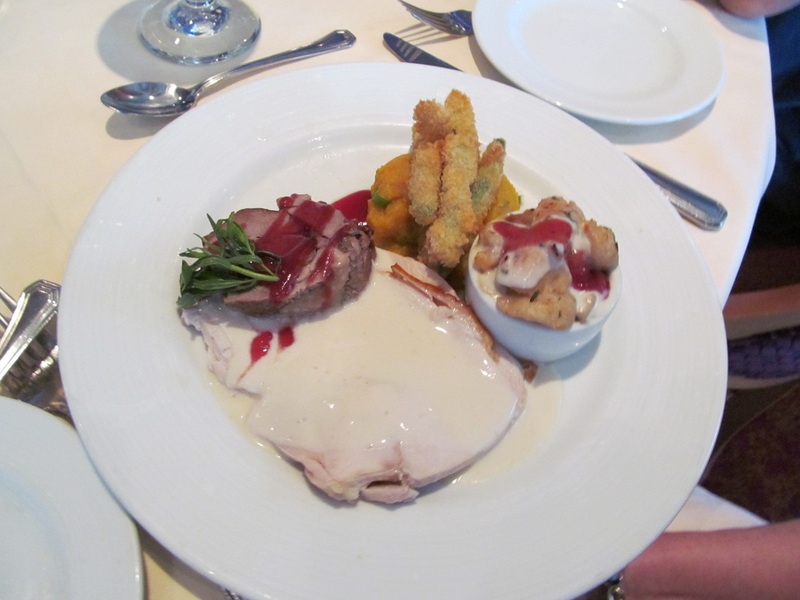 I still didn't get my bacon served to me! 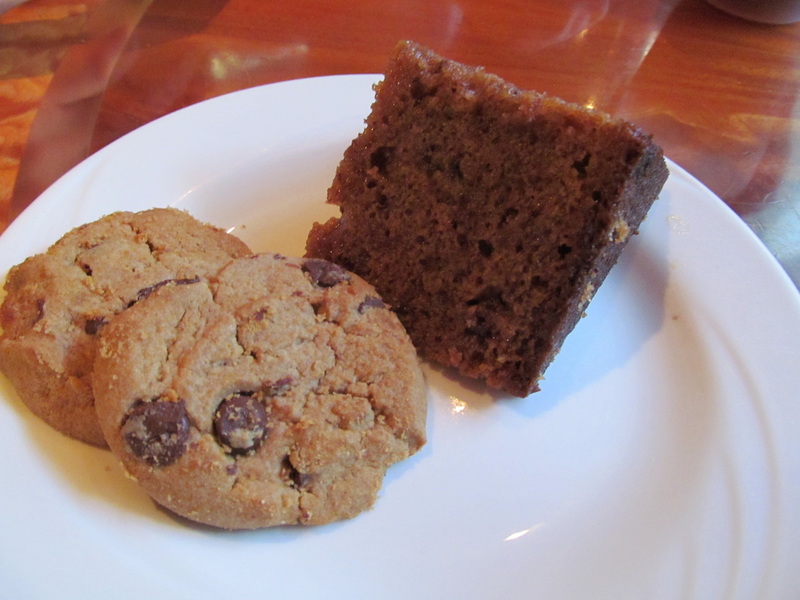 I only took 1 breakfast picture today. 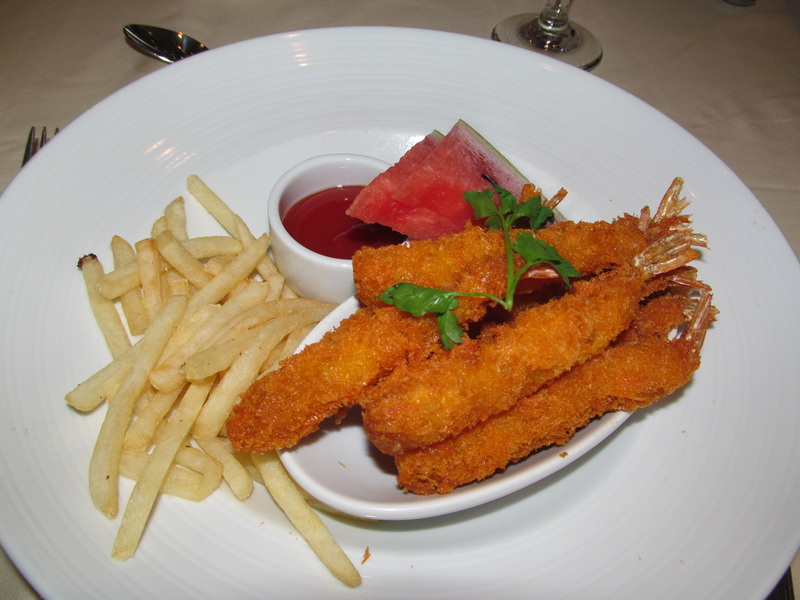 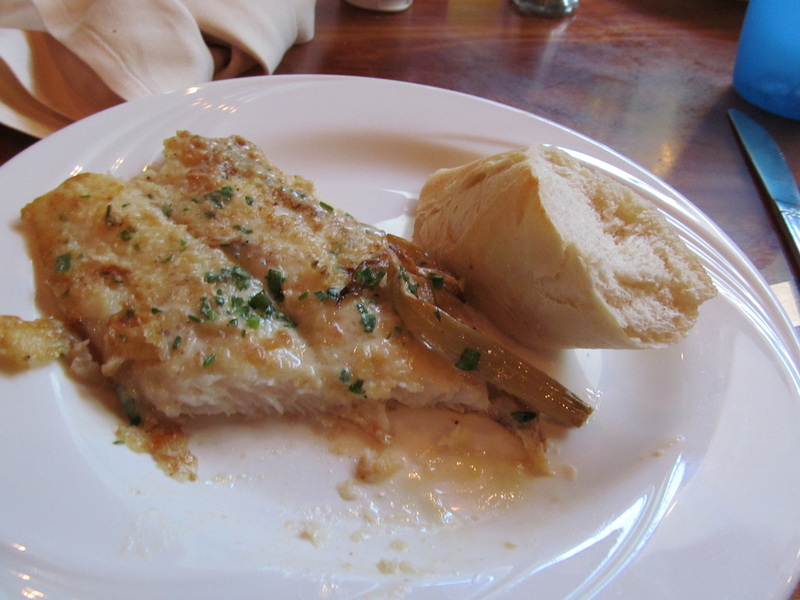 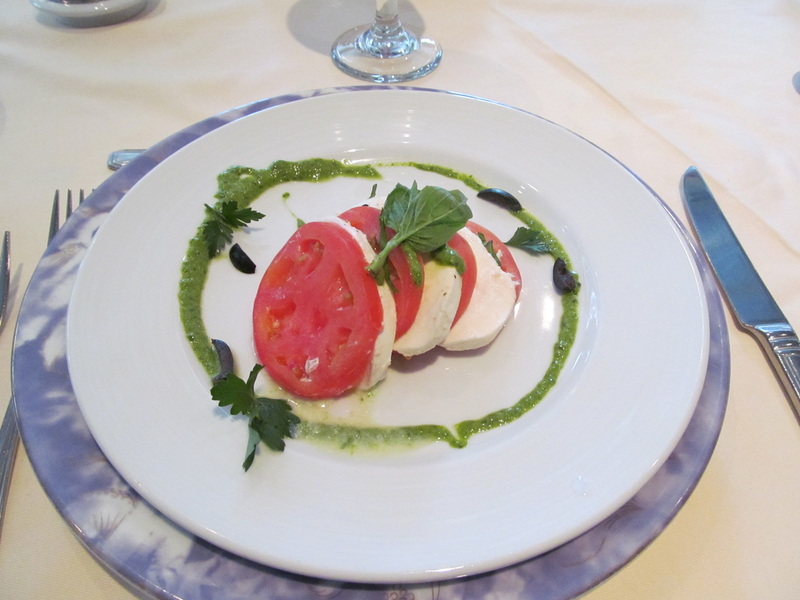 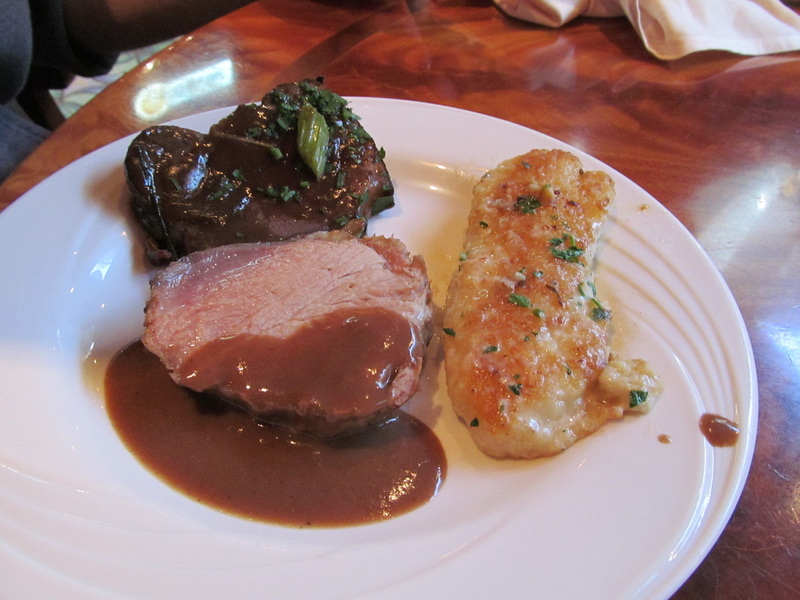 There are more food pictures (lunch and dinner) later in Day 4's review. 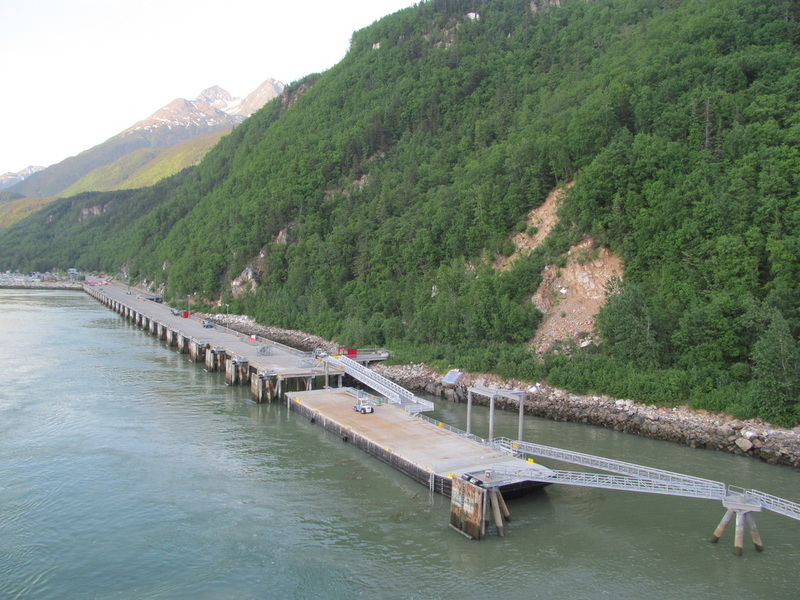 Gangway Closes; Tide Shifts: When I was ready to get off an announcement was made that the gangway was closing and would be moved onto a different deck. 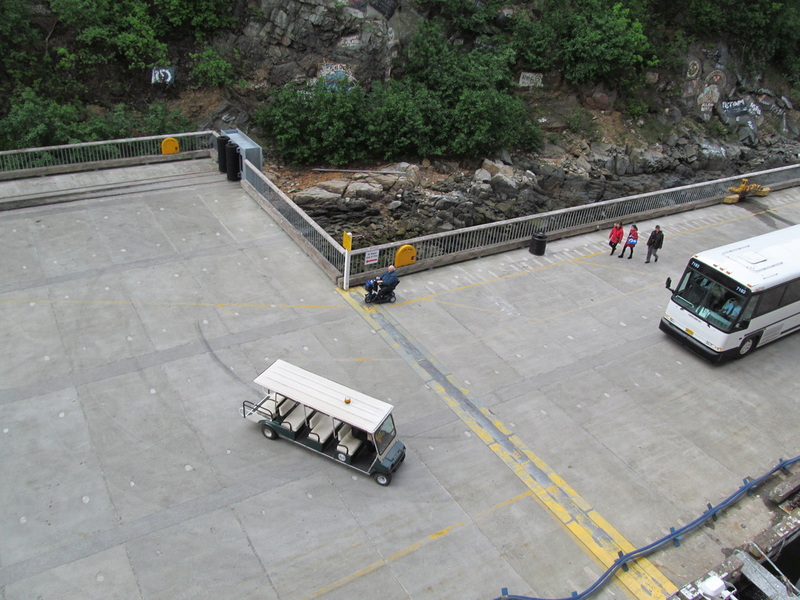 I decided to go wait in line at the designated area. 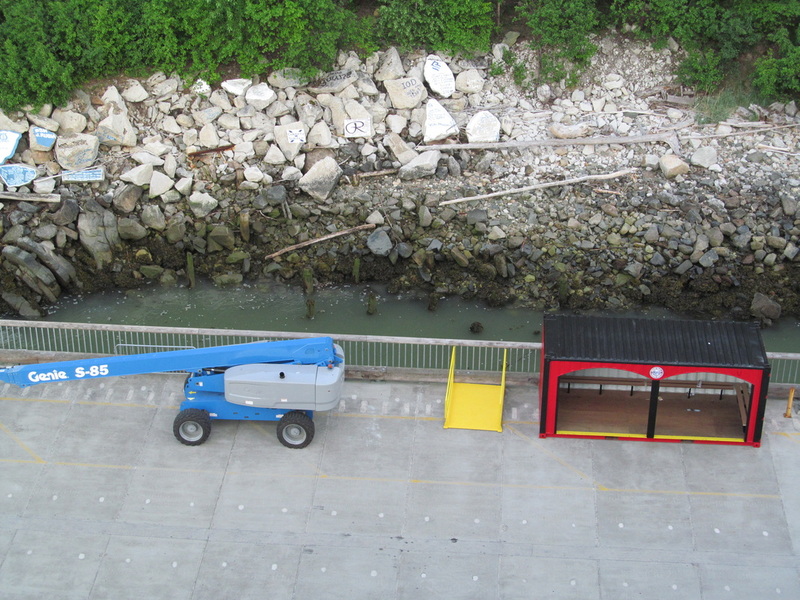 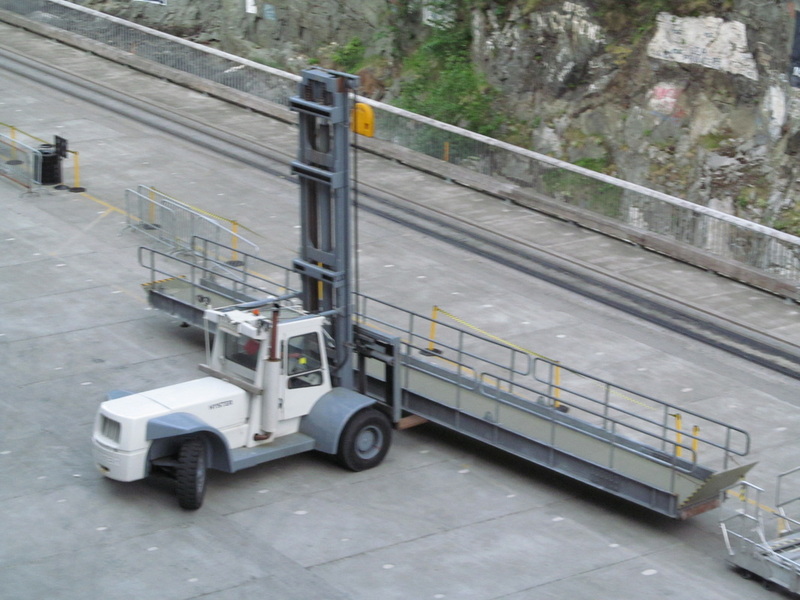 In order to move the gangway the pier workers have to get a "gangway mover" (picture below) and remove the gangway and then lower or raise it to a different deck. 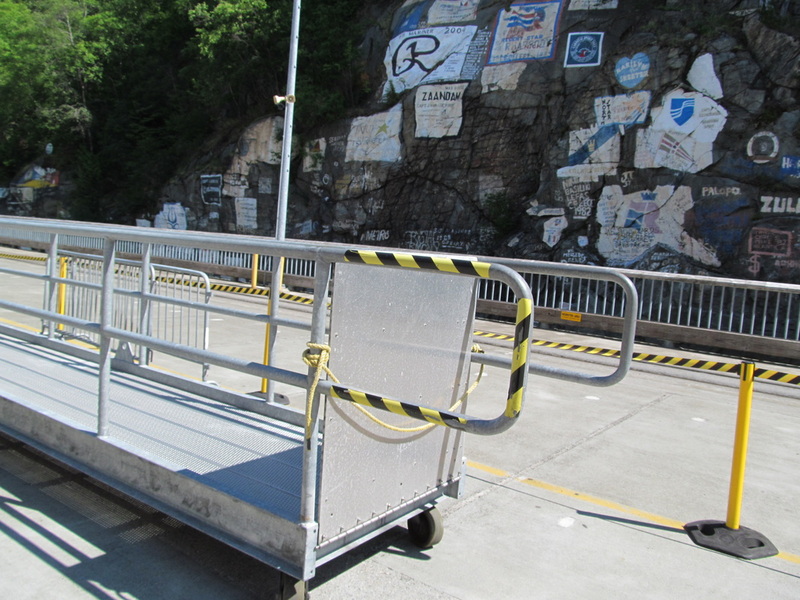 Meanwhile, on the ship the photography staff have to move their equipment, security has to move the x-ray and Sail & Sign Machines, and the all of the posters & information signs have to be moved. 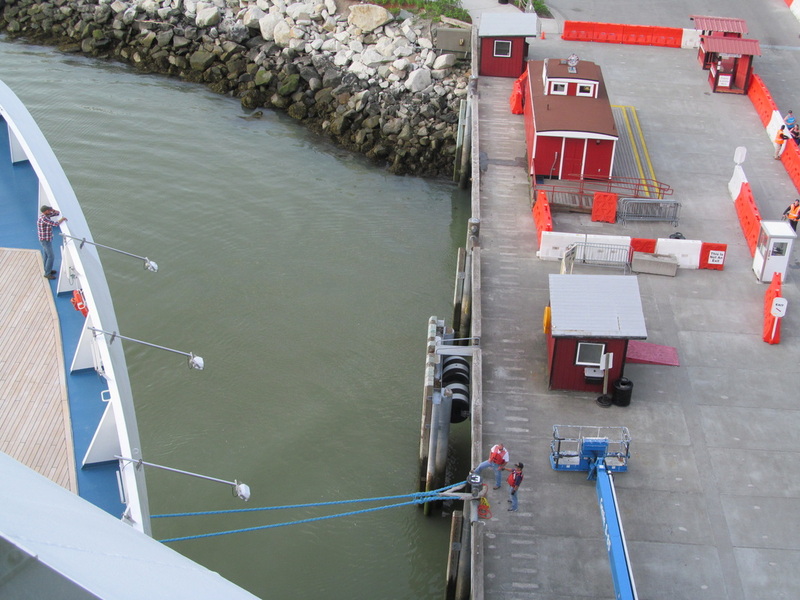 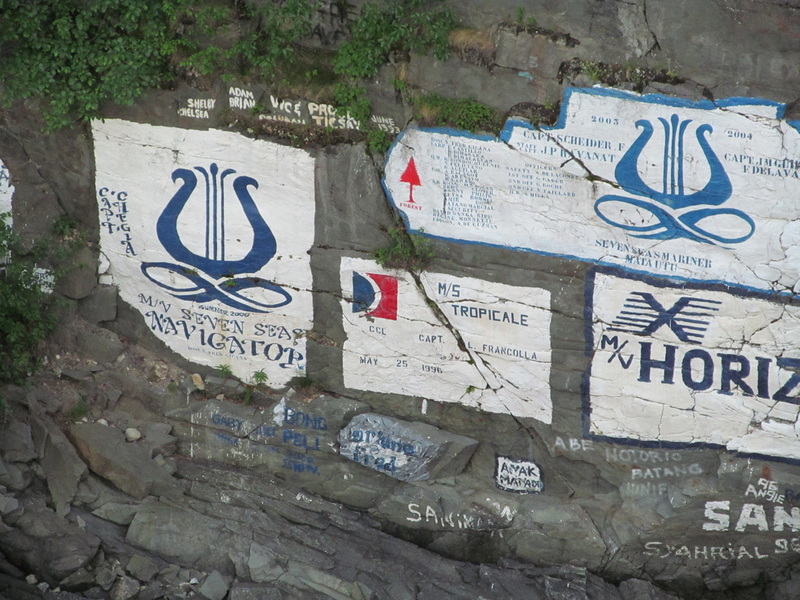 It is a lot of work changing the gangway because of tides! 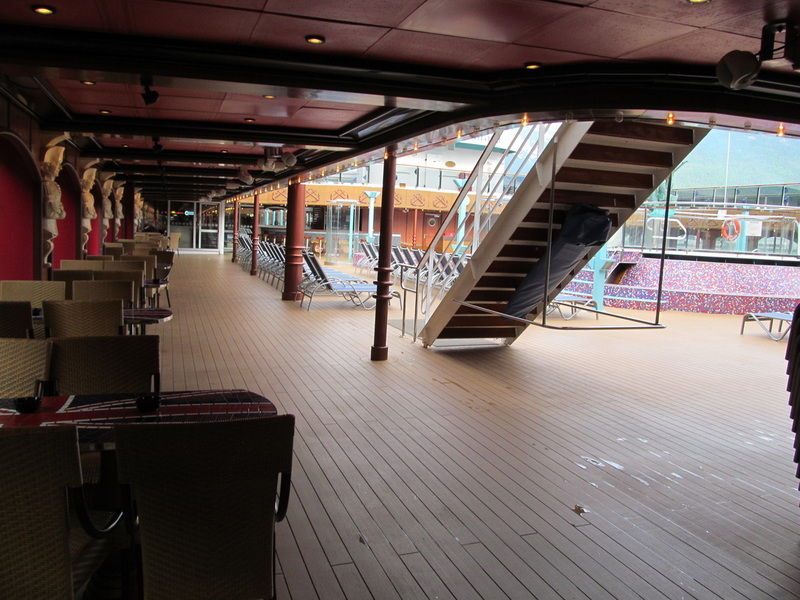 The process of changing floors takes only 20-25 minutes. 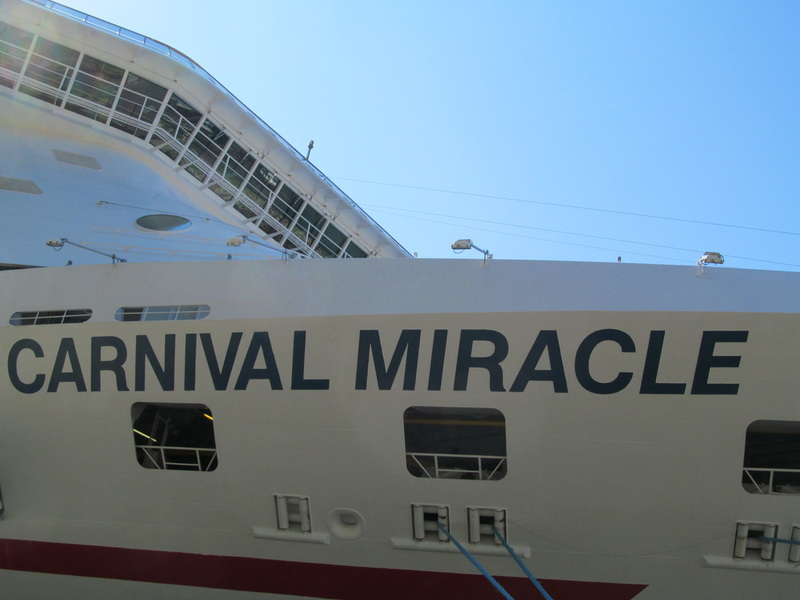 A few minutes after getting off the ship an announcement is made from the Miracle and then the Muster Station Alarm sounded. 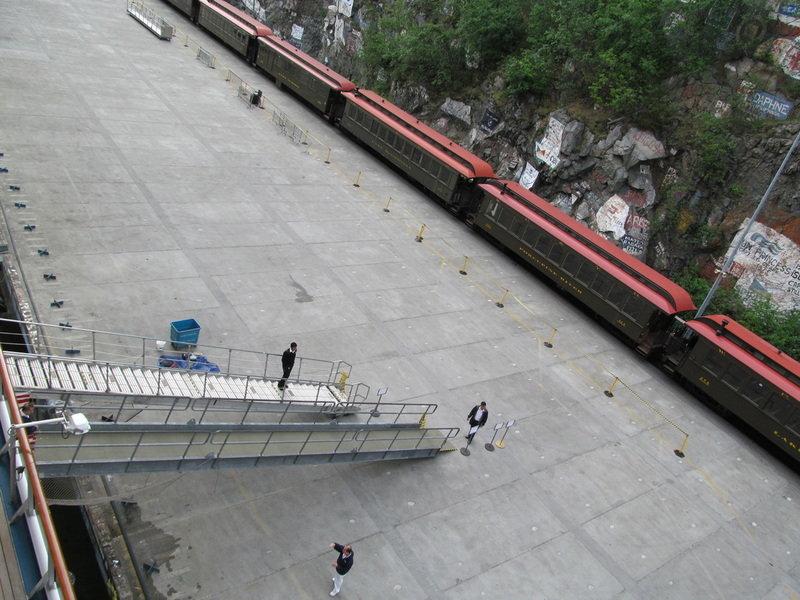 The crew was having an emergency drill. 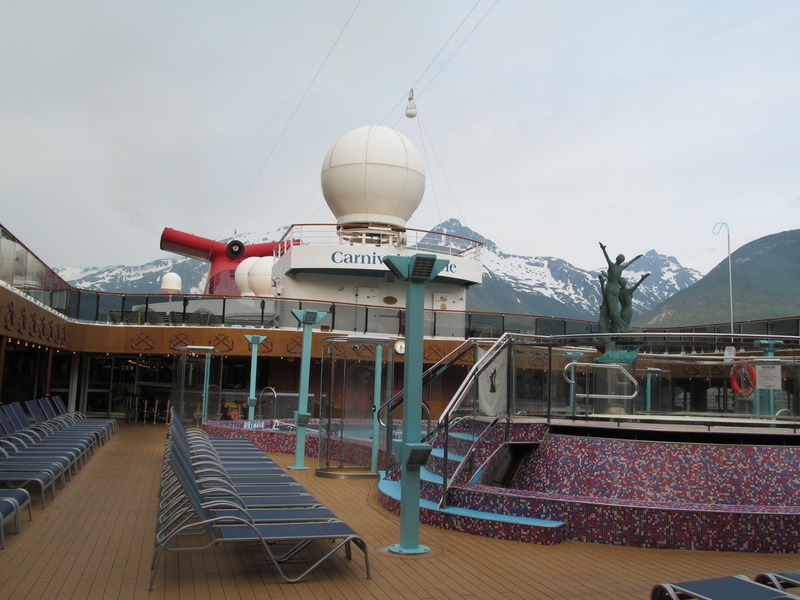 Following the alarm a crew member came over the loudspeaker and told guests to disregard the alarm. 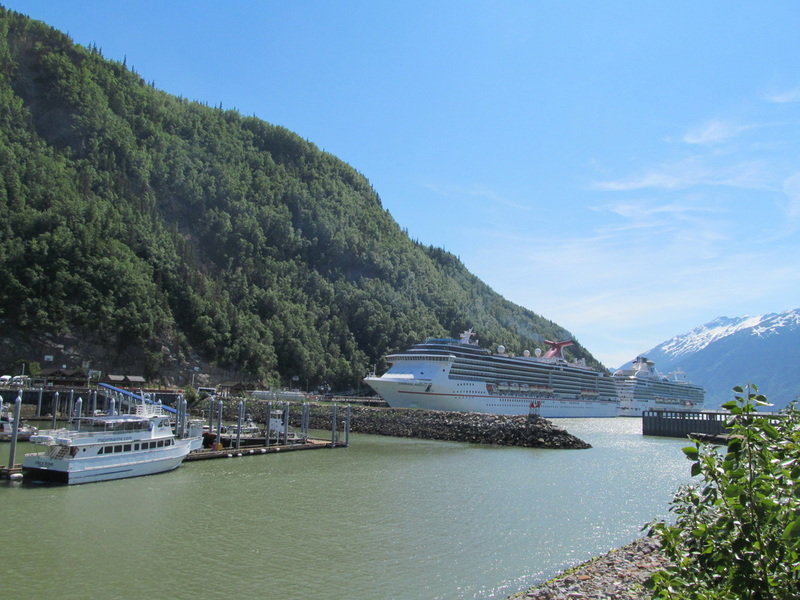 A few minutes later all of the other cruise ships were blowing their muster station alarms. 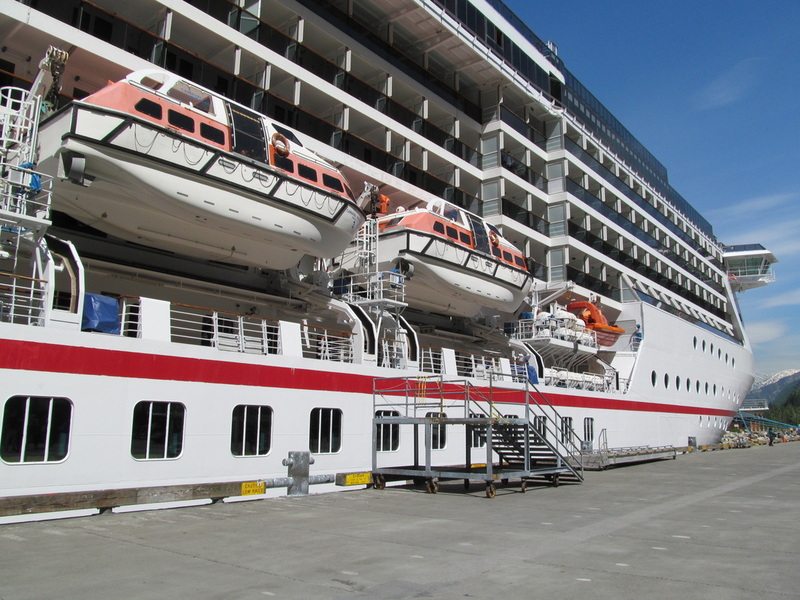 I think the Coast Guard was inspecting the ship's emergency alarms. 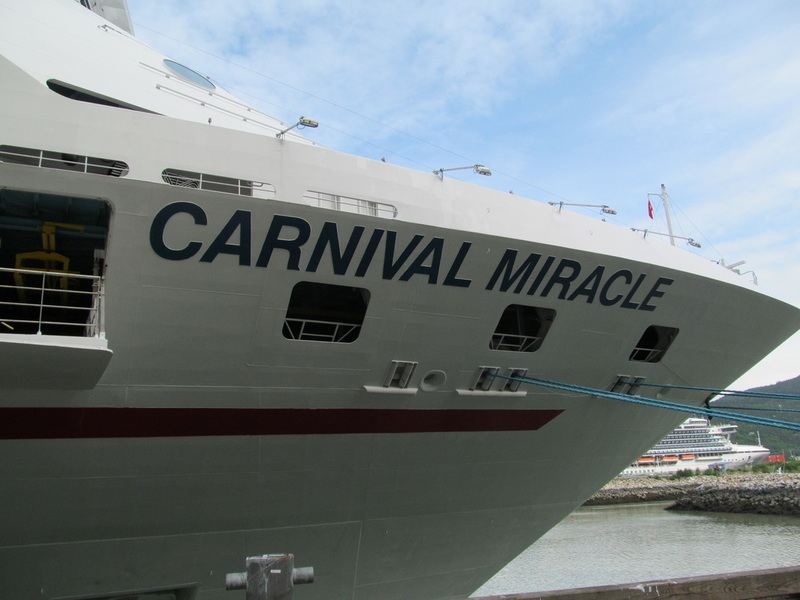 I got part of the Miracle's Muster Station Alarm on video and I will be posting it online soon! 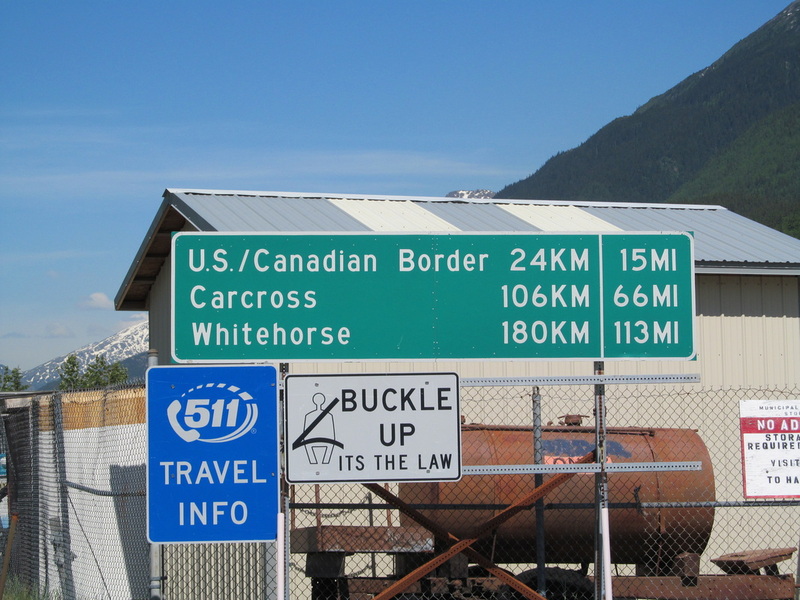 In case you are wondering... 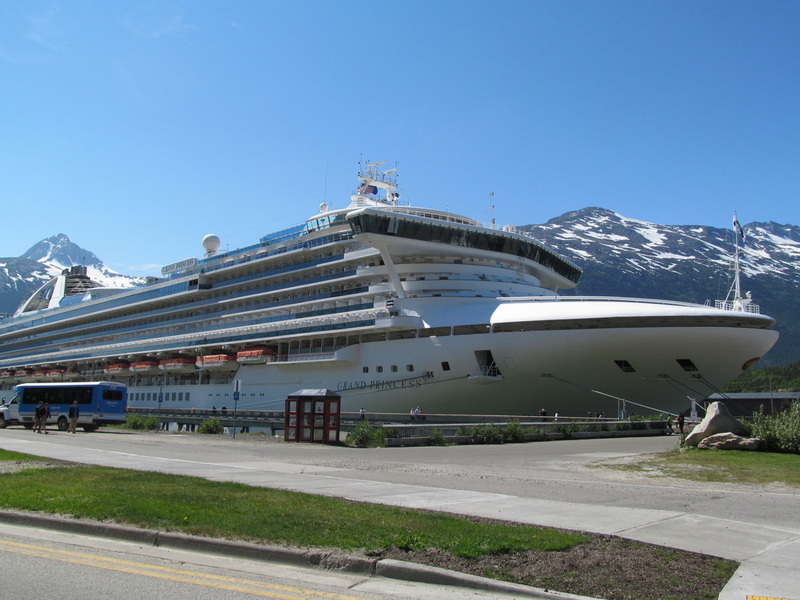 The Grand Princess had the loudest emergency alarm! 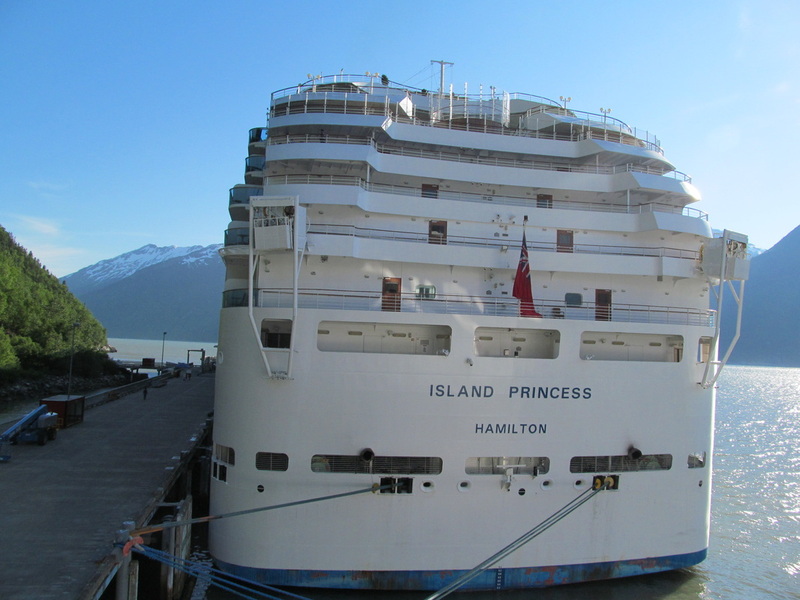 Ship Name With On "Mouth"
After dinner I went outside on Deck 3 to the very back to get a picture of the Island Princess. 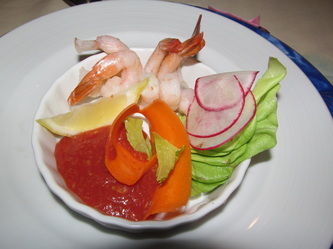 At dinner we got a table at the very back so we had a good view of the back of the Island Princess. 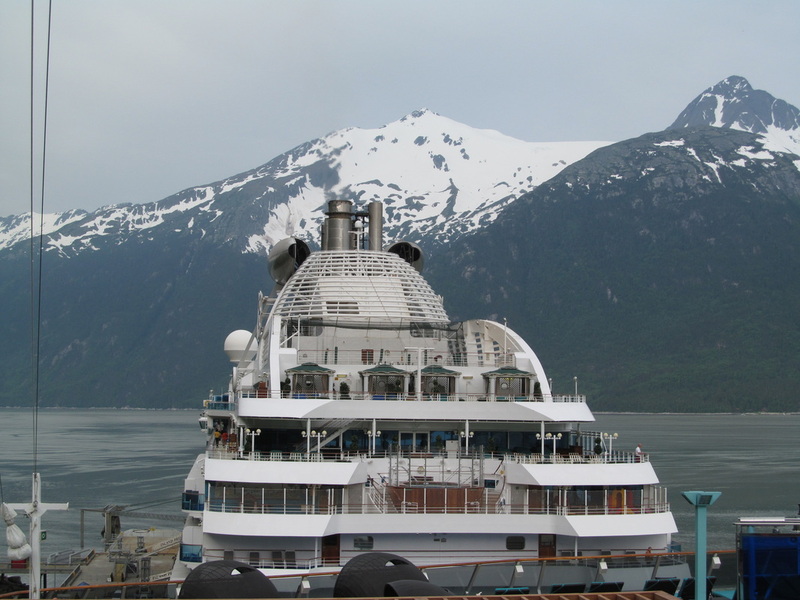 Show: "North to Alaska": A local entertainer came onto the ship and did a show before the ship left port. 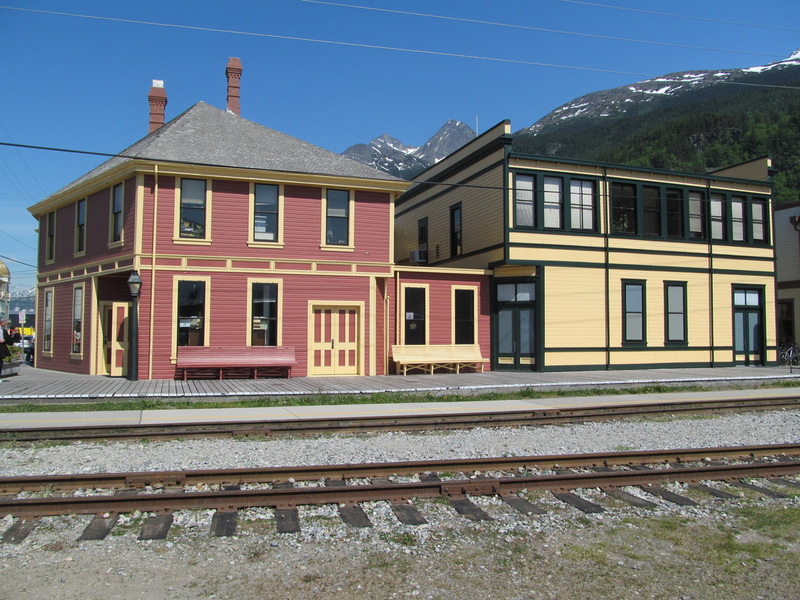 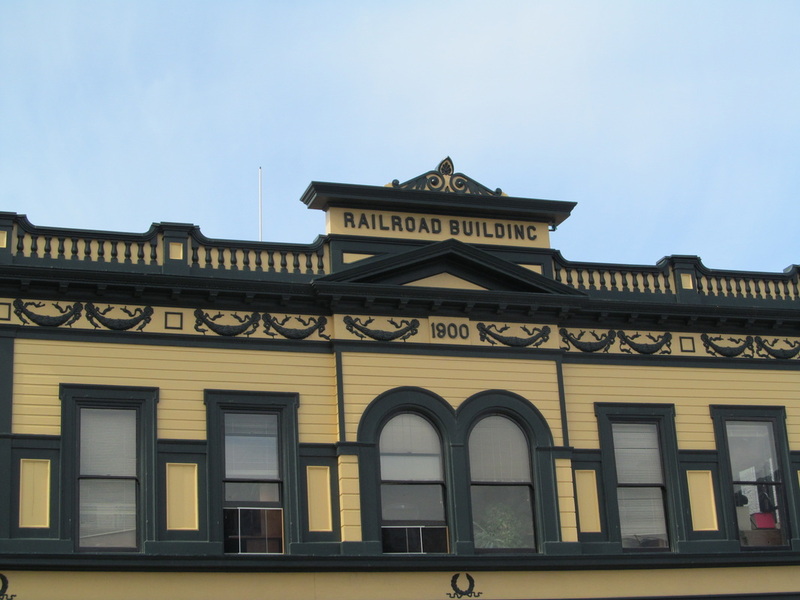 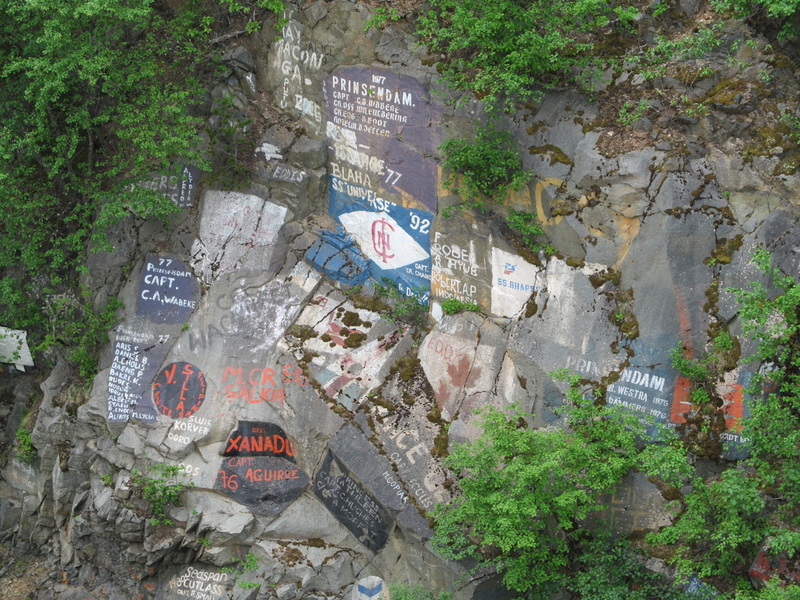 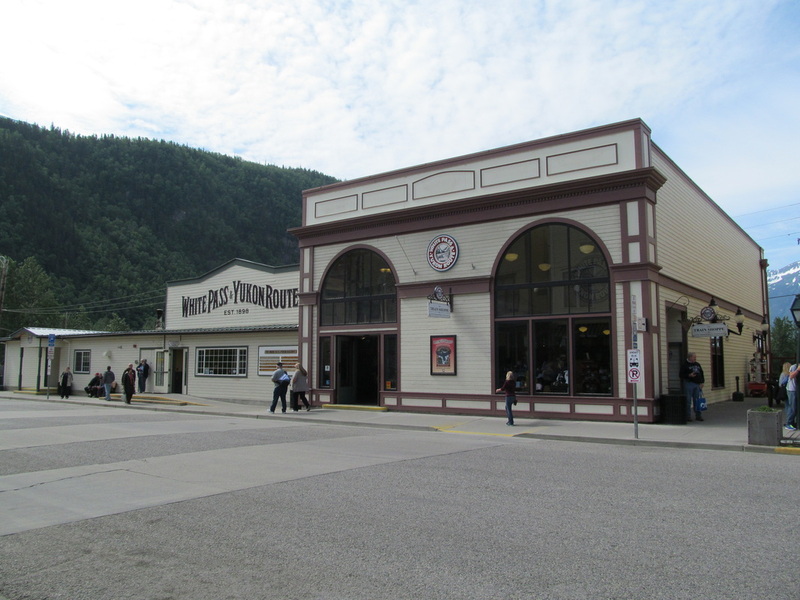 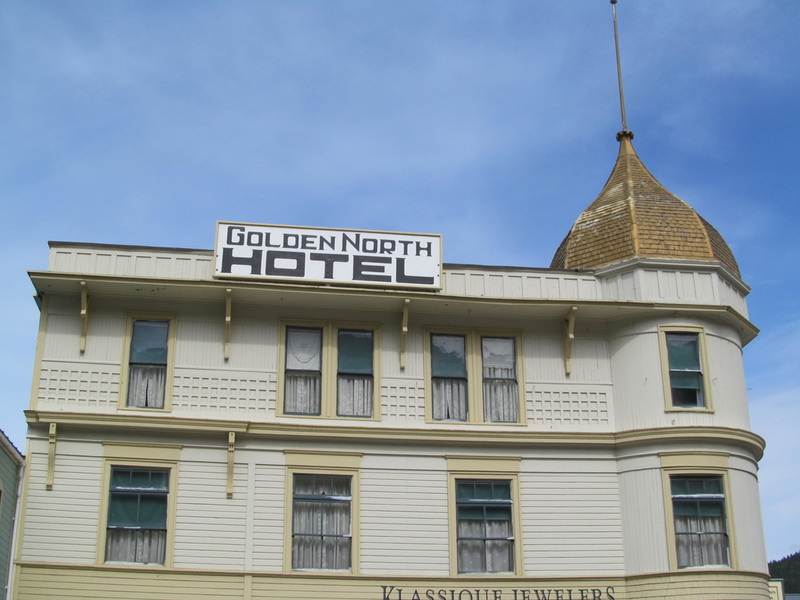 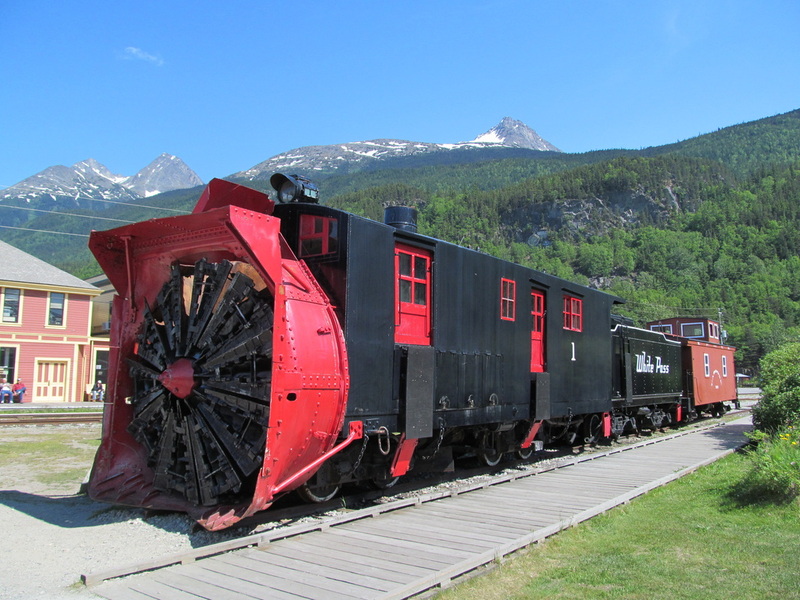 This show presented the history Skagway through songs and stories. 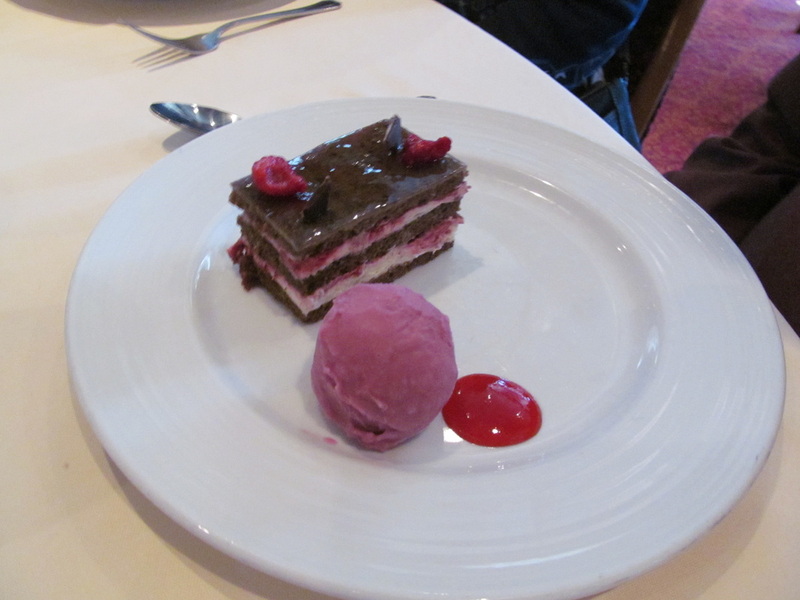 It was very good and very informational! 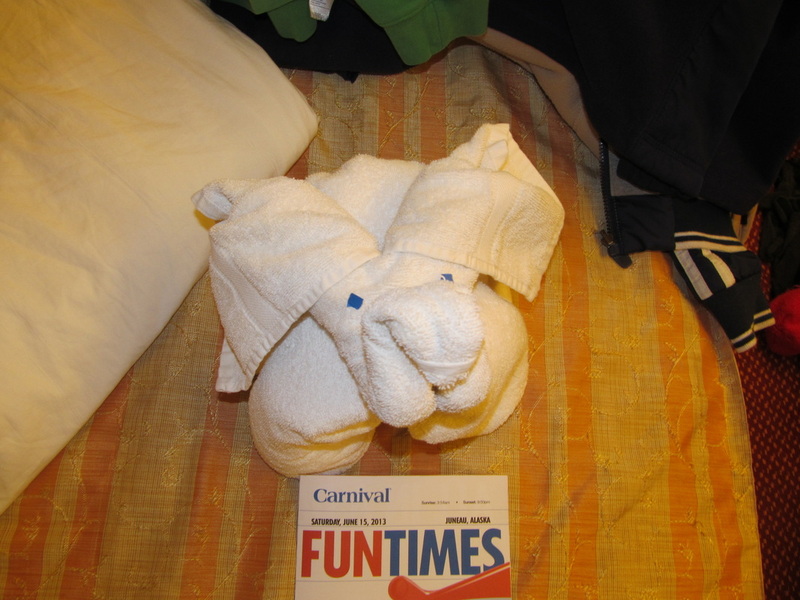 After dinner my stateroom was cleaned and a new towel animal was left. 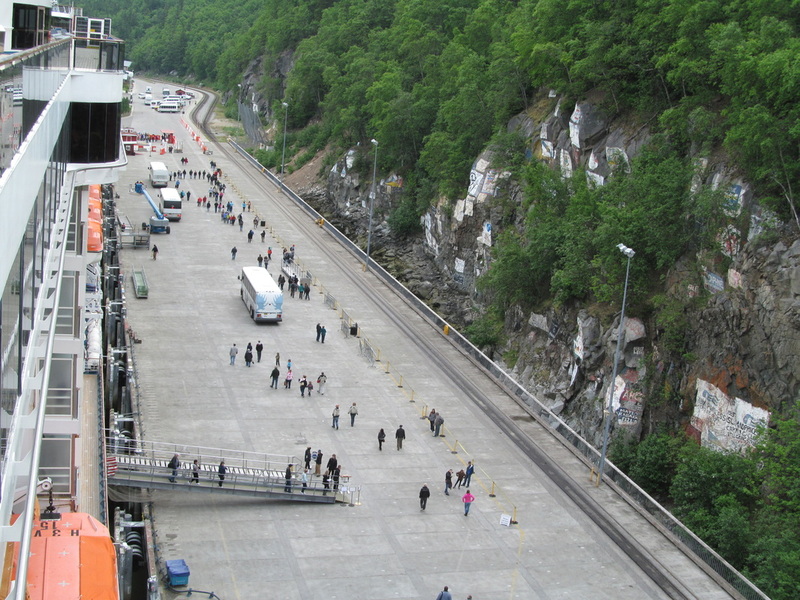 Before the gangway was removed from the ship a few guests were running down the pier yelling "wait for me". 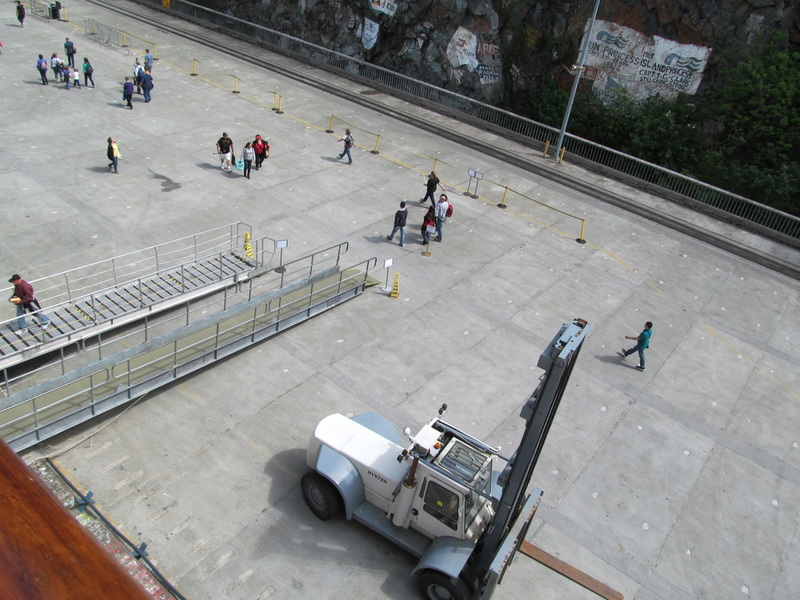 They were lucky they made it because the gangway removal truck was almost hooked up to remove the gangway. 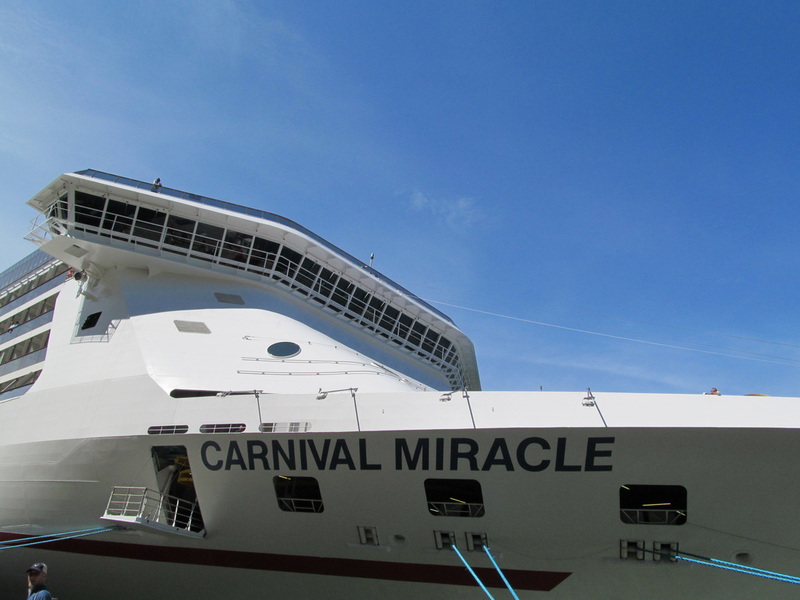 The people were able to make it onboard, but I heard some people were not as lucky. 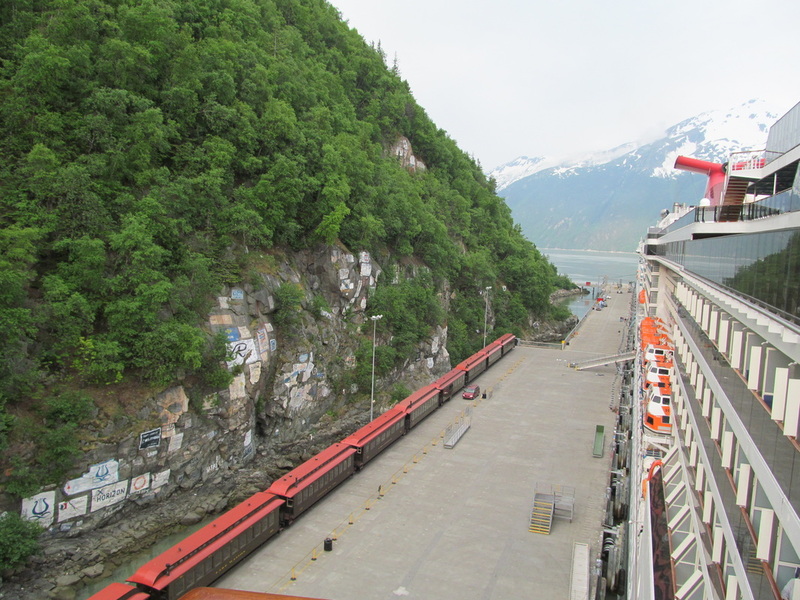 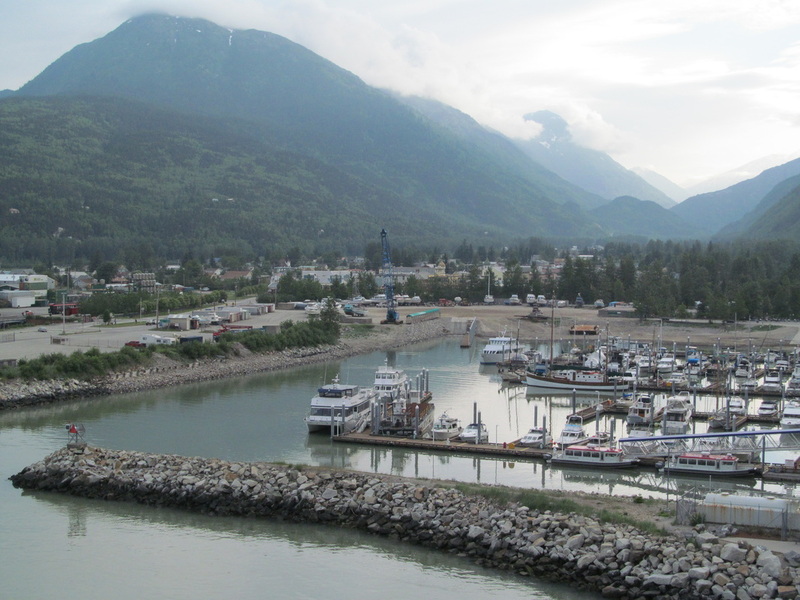 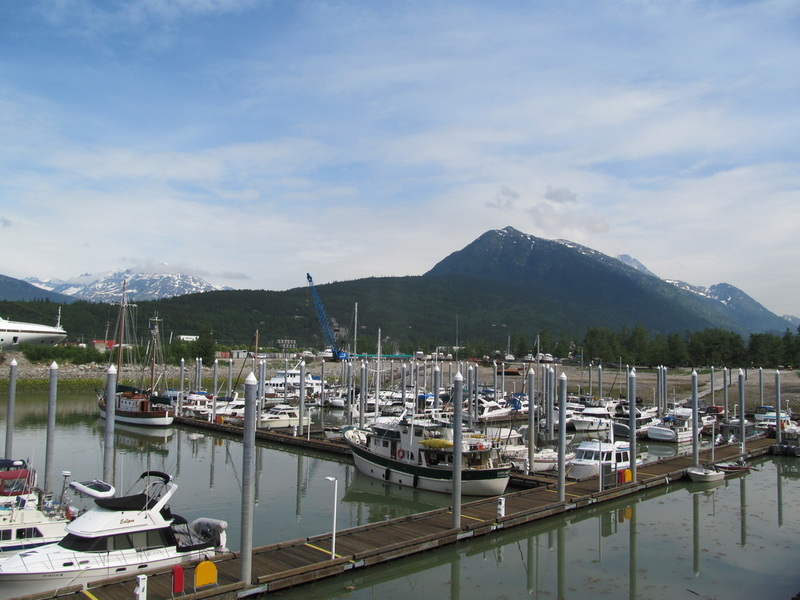 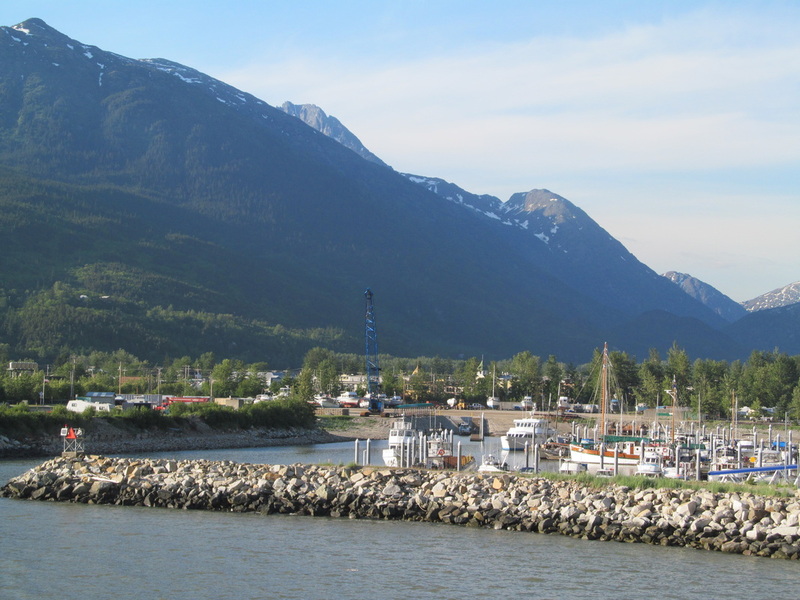 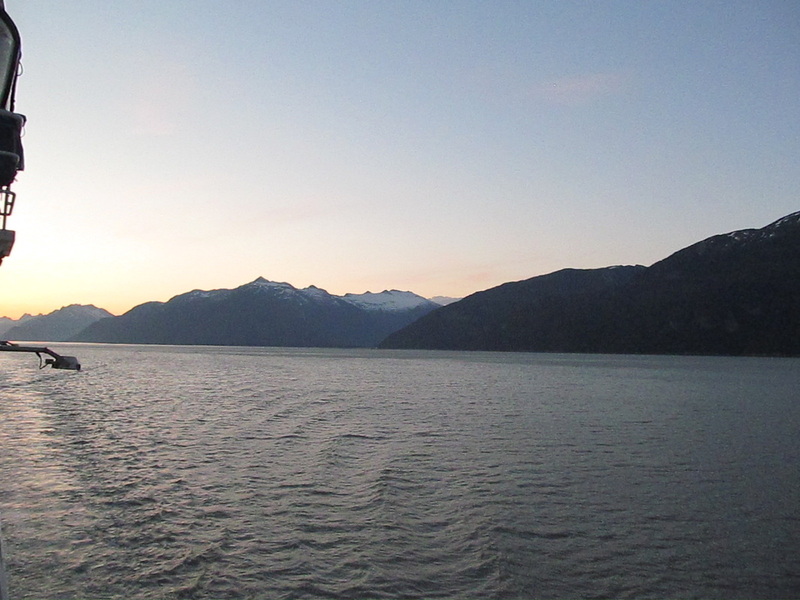 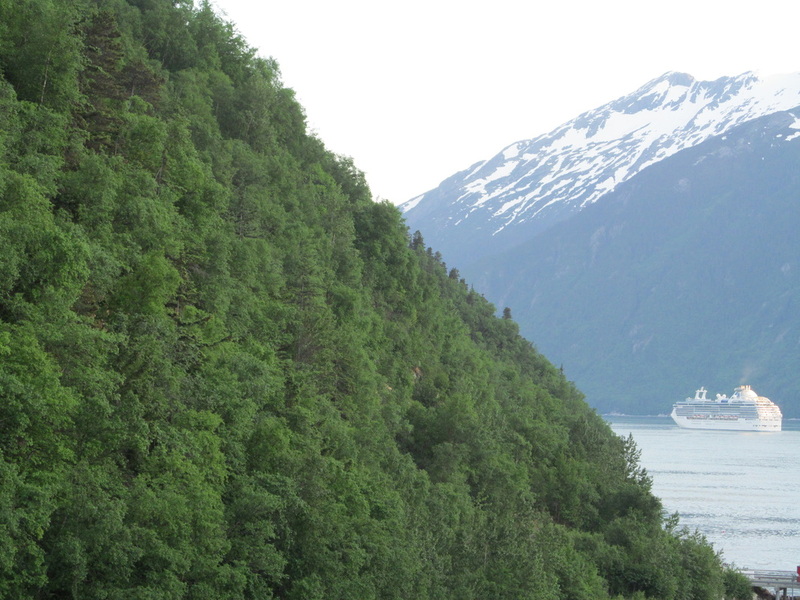 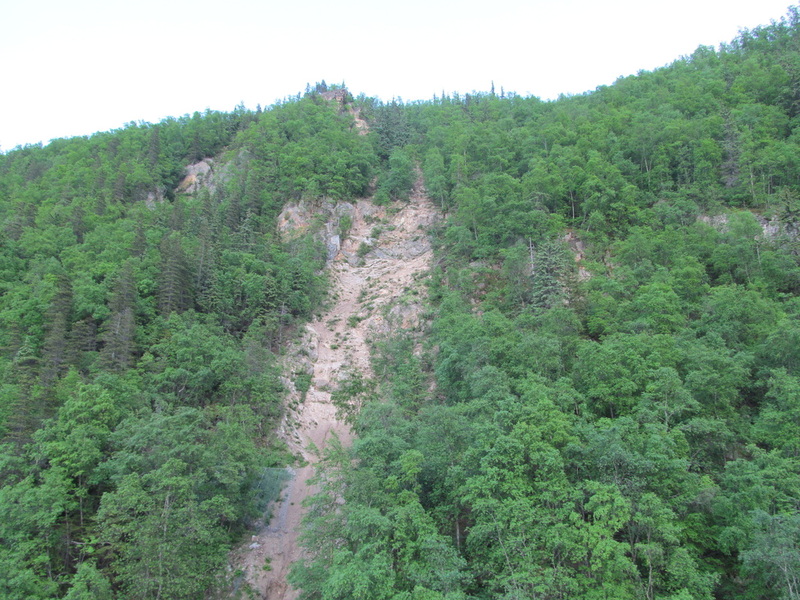 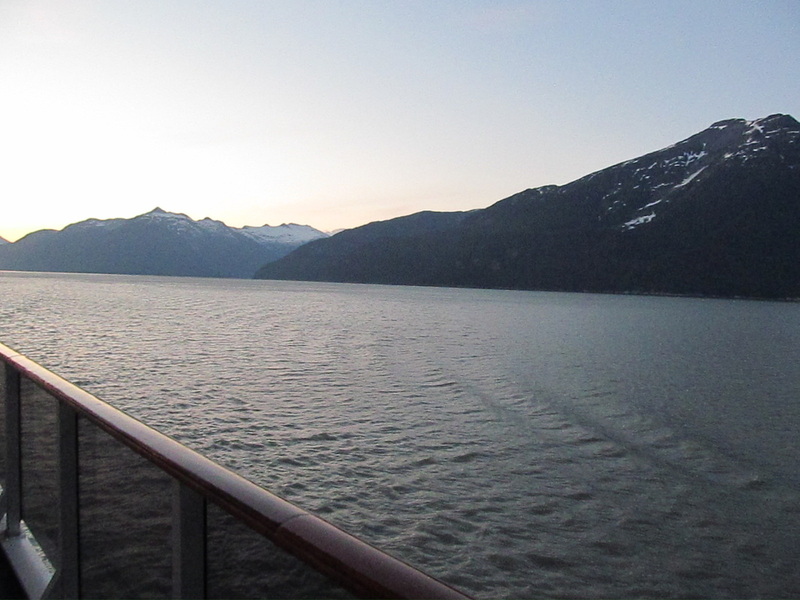 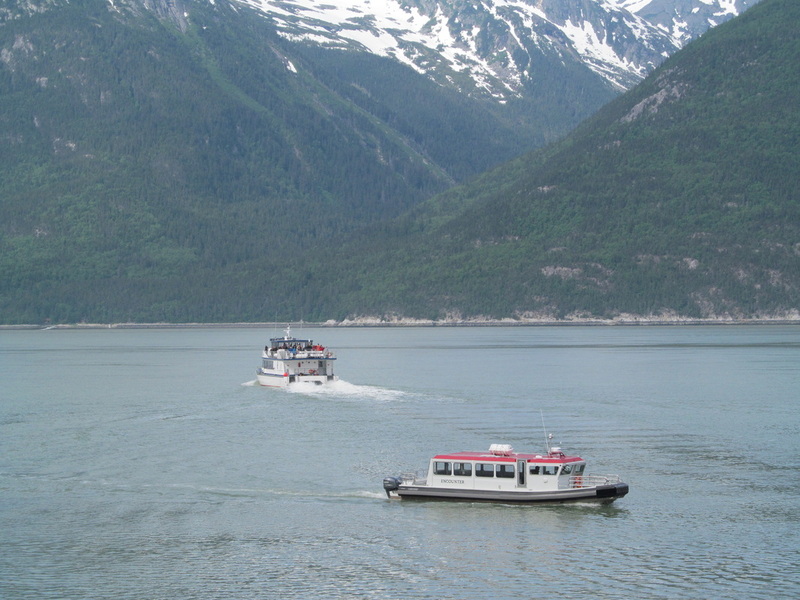 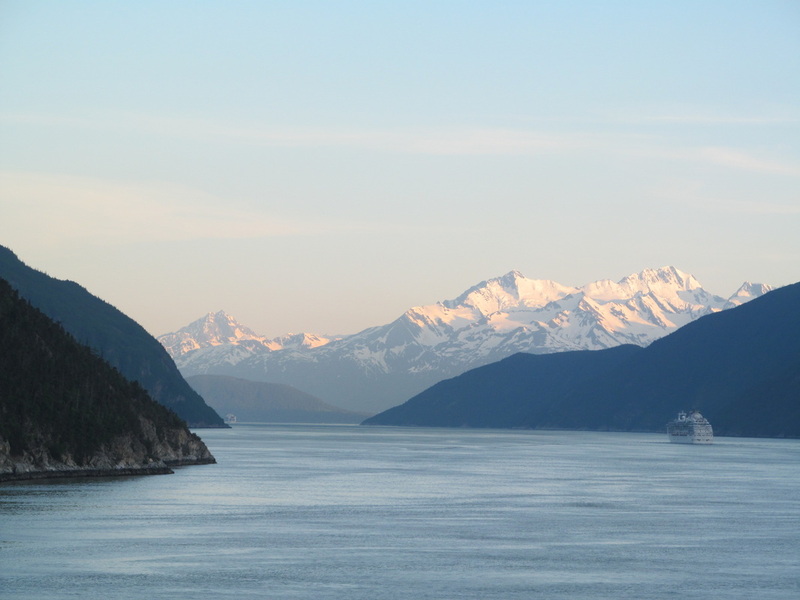 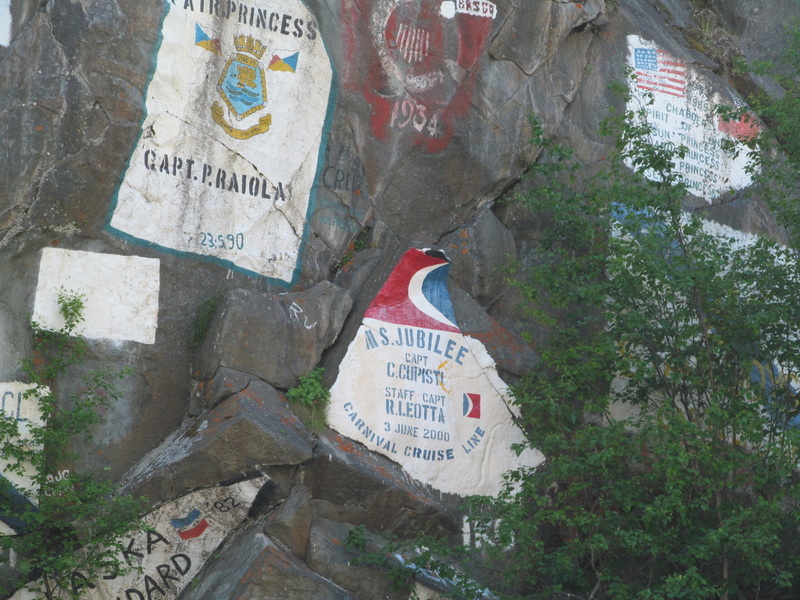 Setting Sail: The ship was scheduled to leave Skagway, Alaska around 9:00PM. 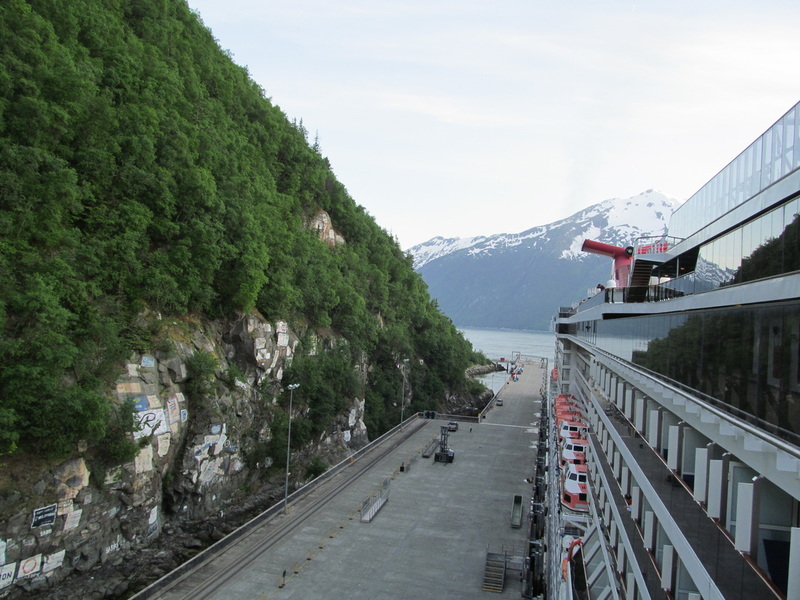 I think the ship left on-time. 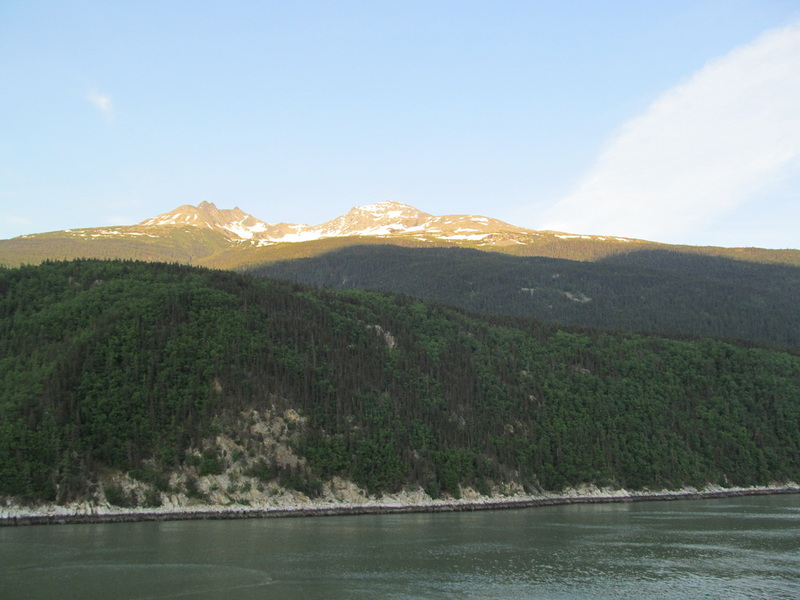 It was still full daylight as we pulled out of Skagway. 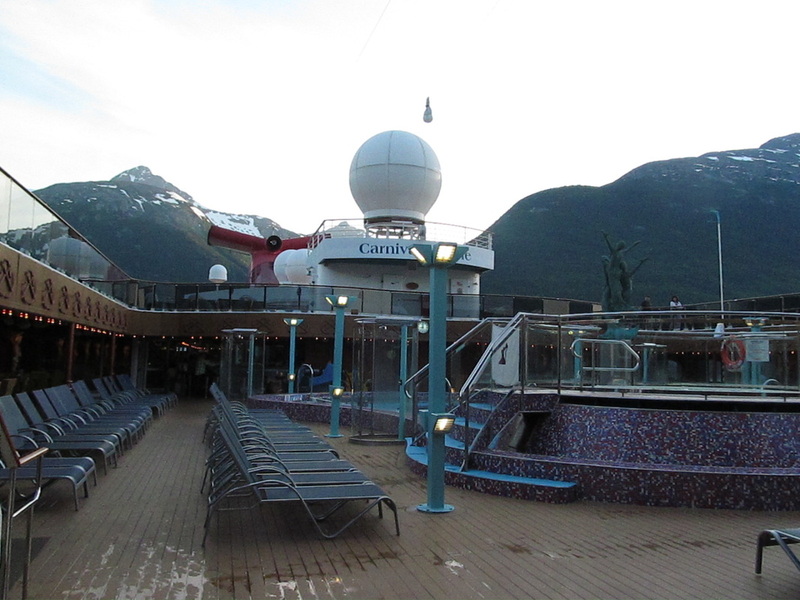 Hypnotist Show: Later in the evening we also were treated to a hypnotist show. 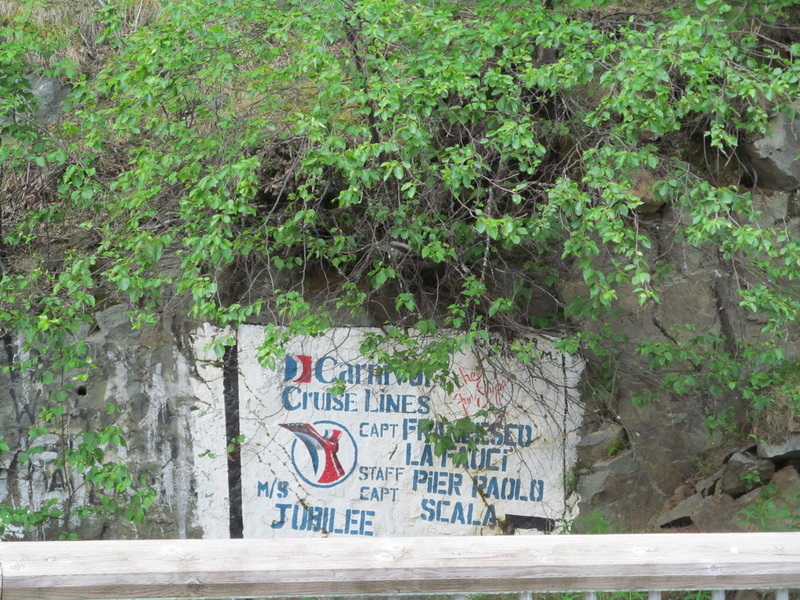 The show was very funny and well worth watching. 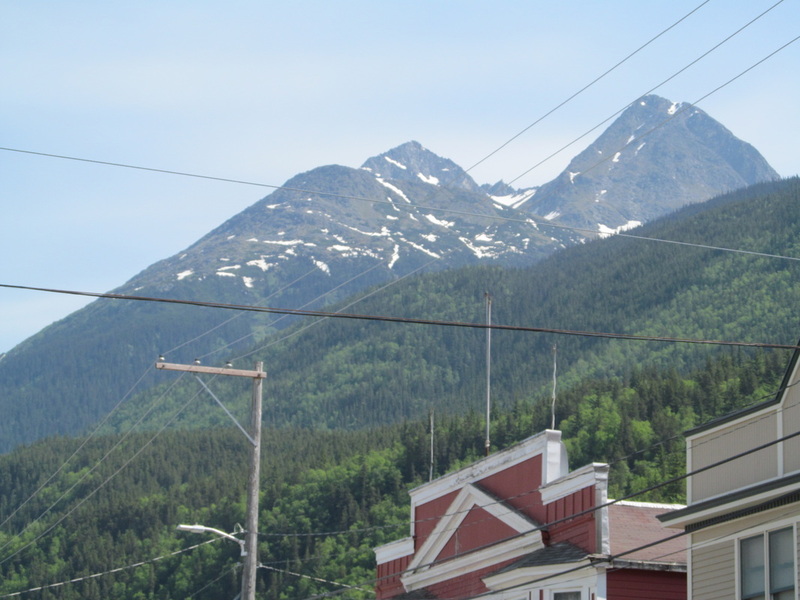 The hypnotized people did crazy things like smell each other's shoes and dance around on the stage. 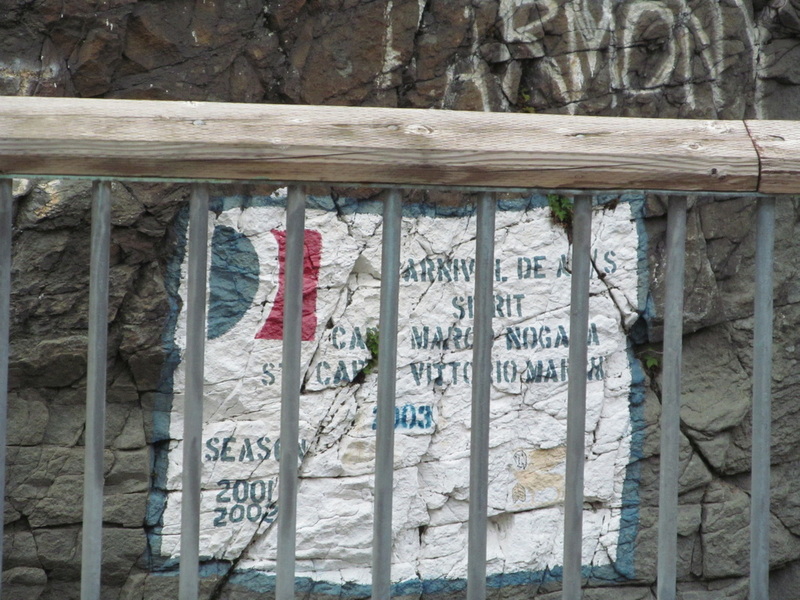 I have not decided if it was real or acting. 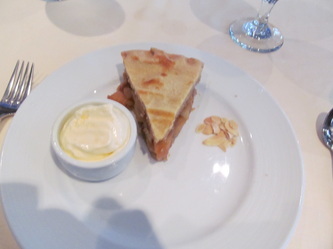 The show was very good!